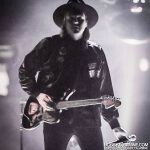 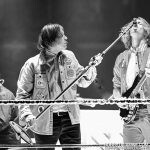 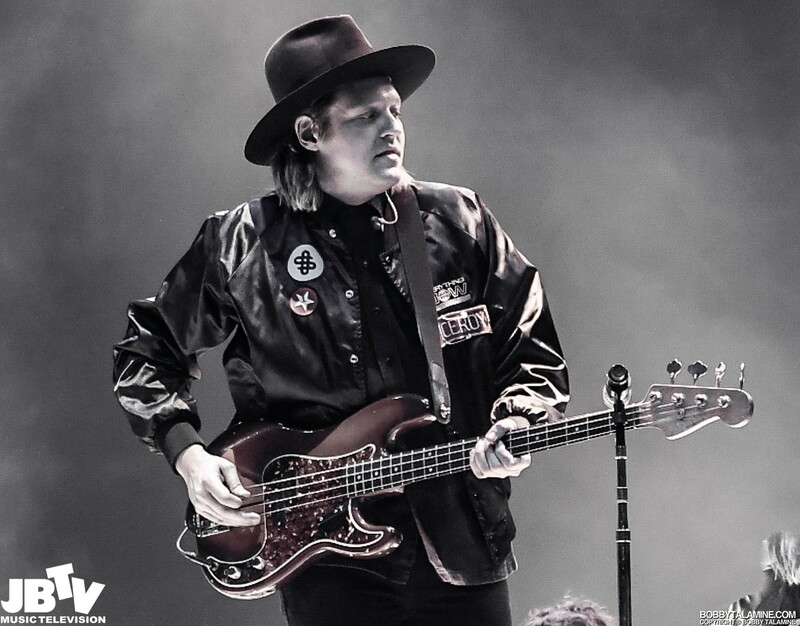 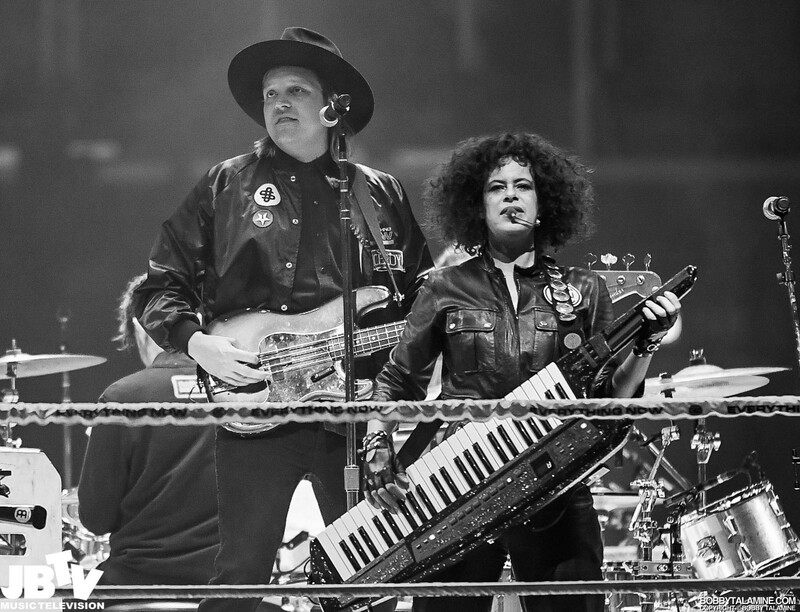 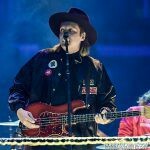 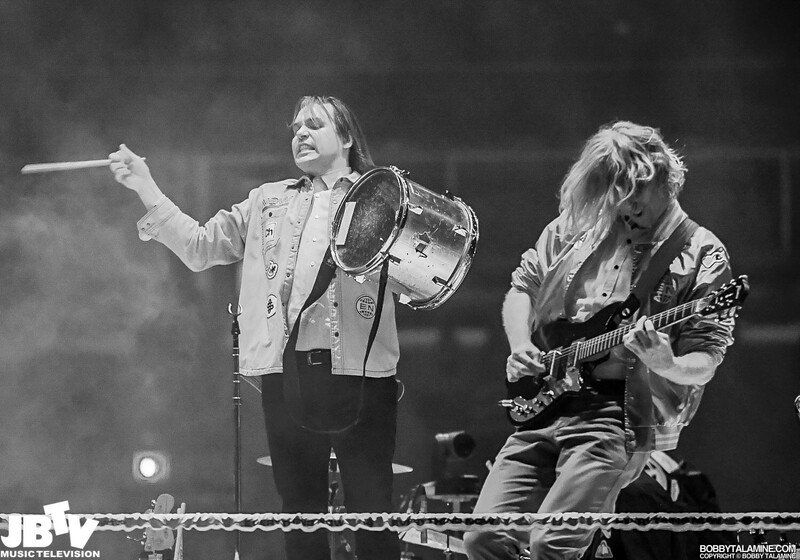 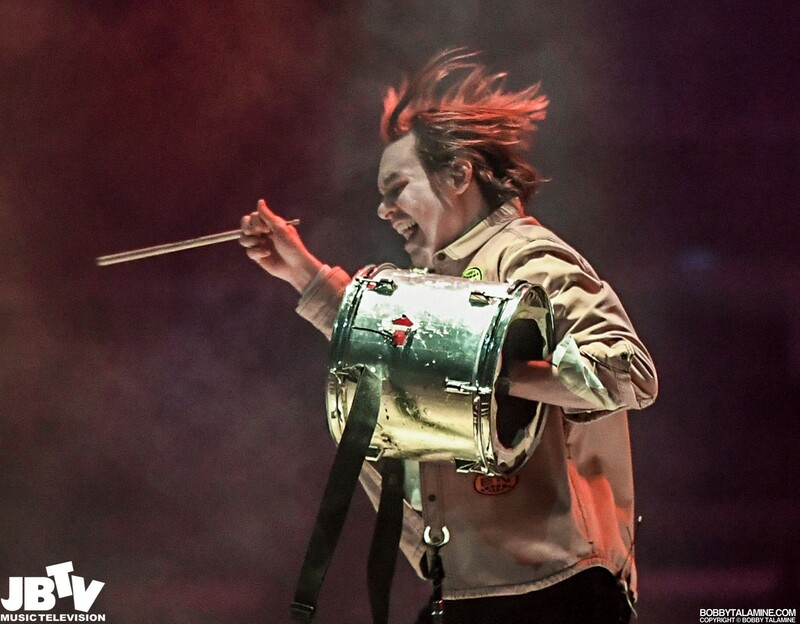 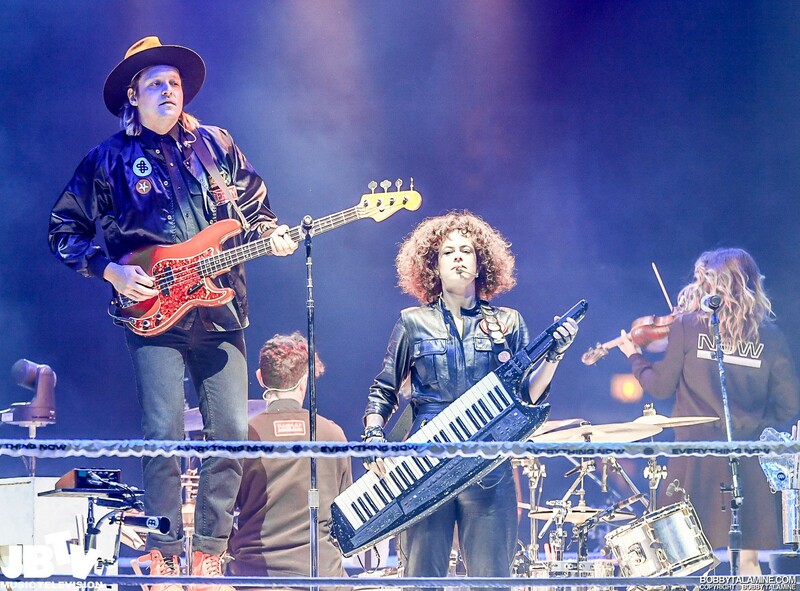 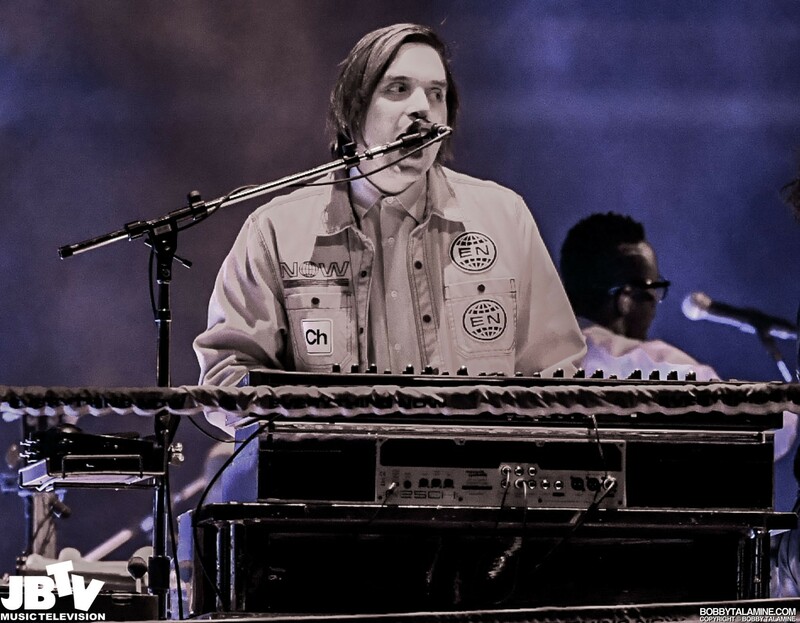 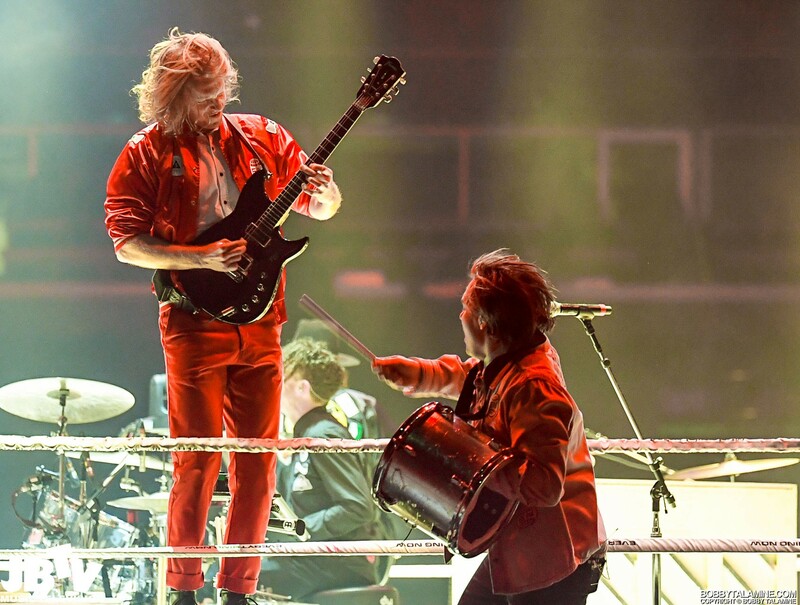 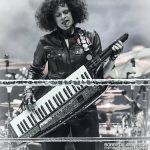 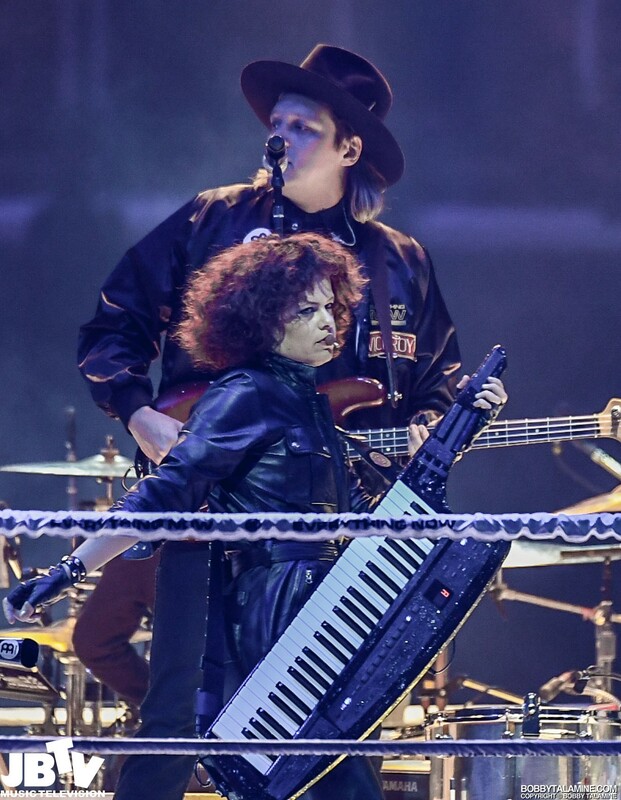 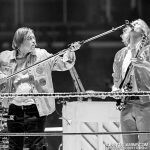 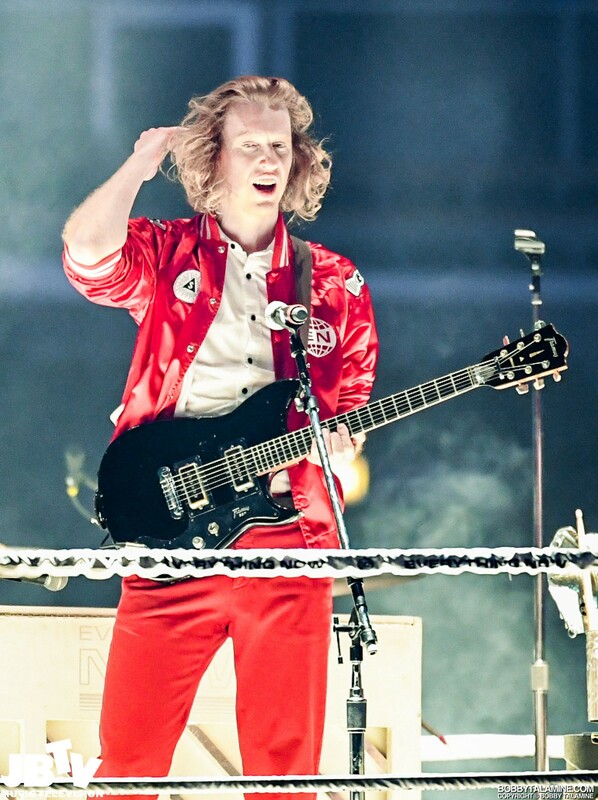 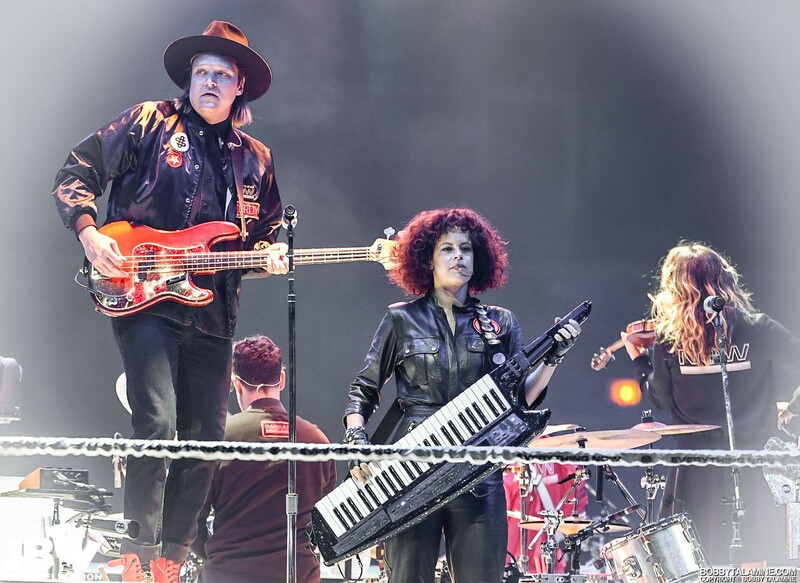 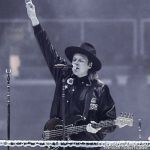 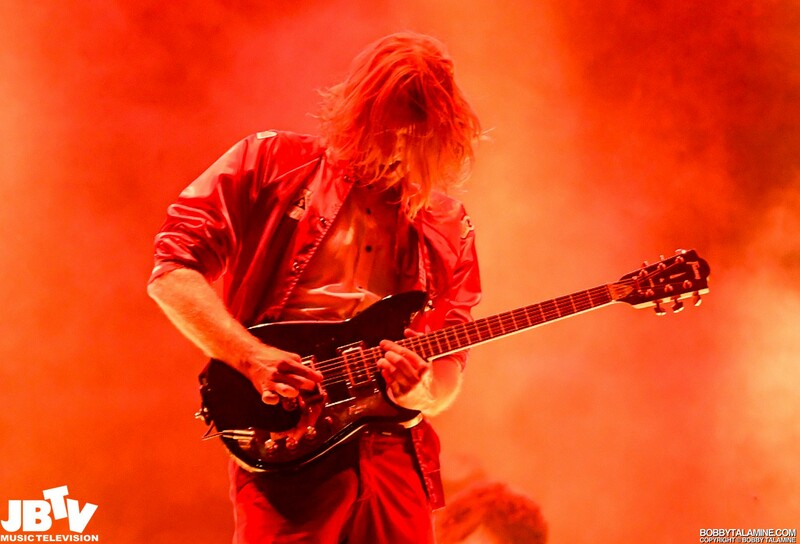 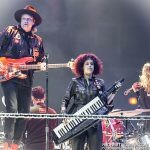 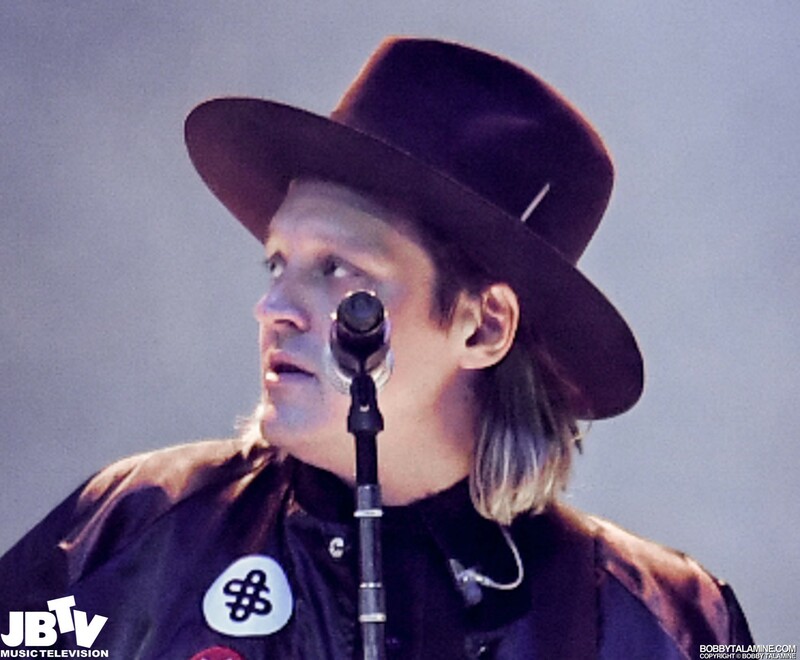 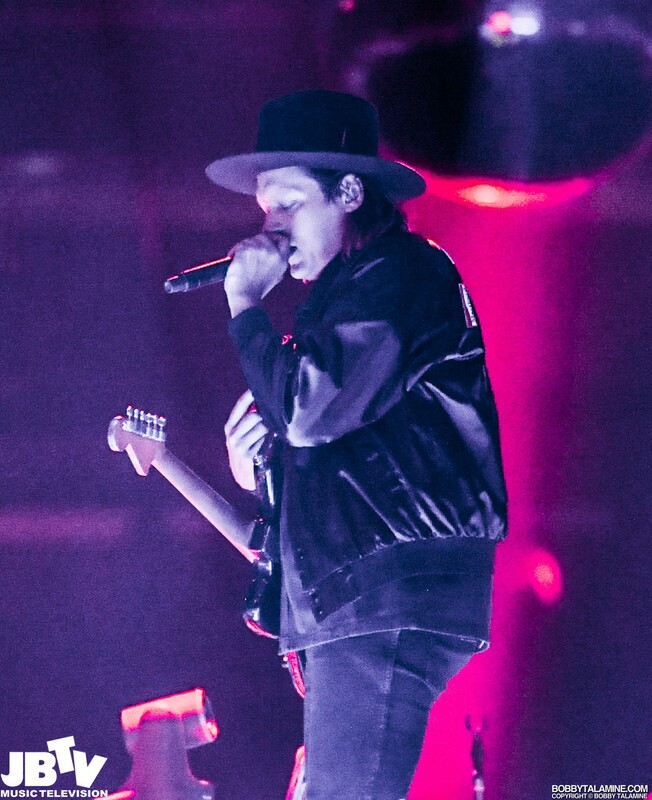 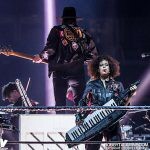 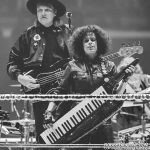 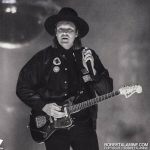 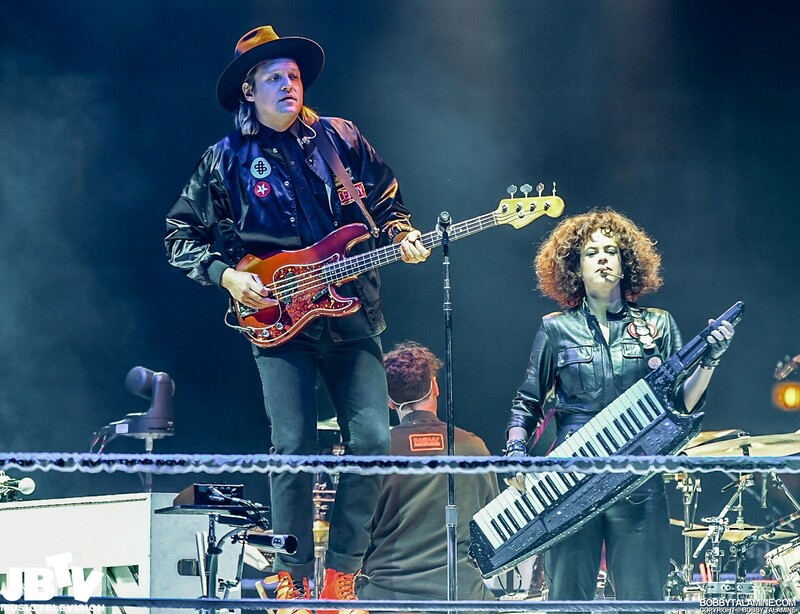 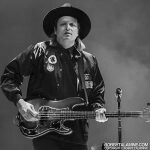 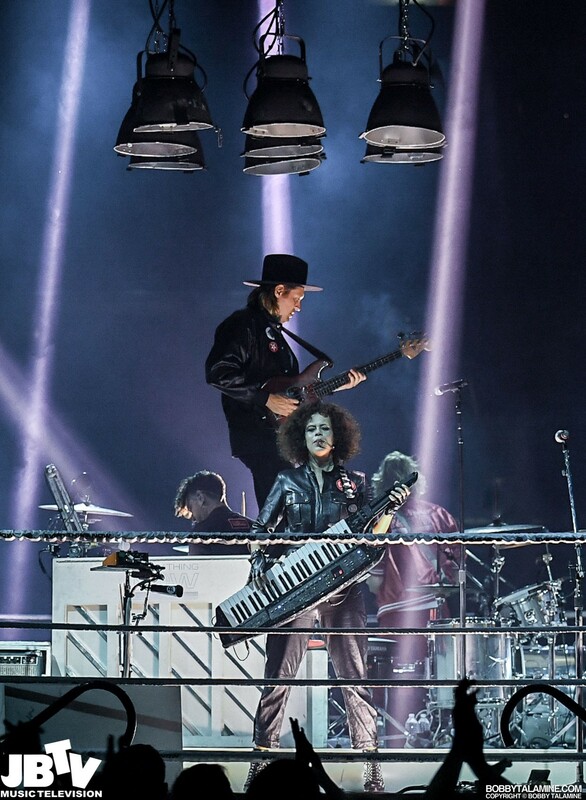 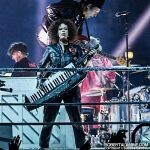 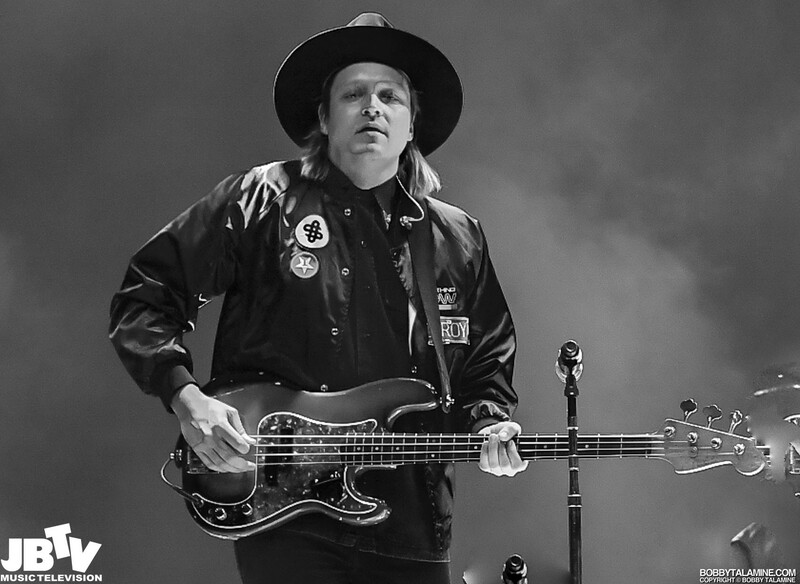 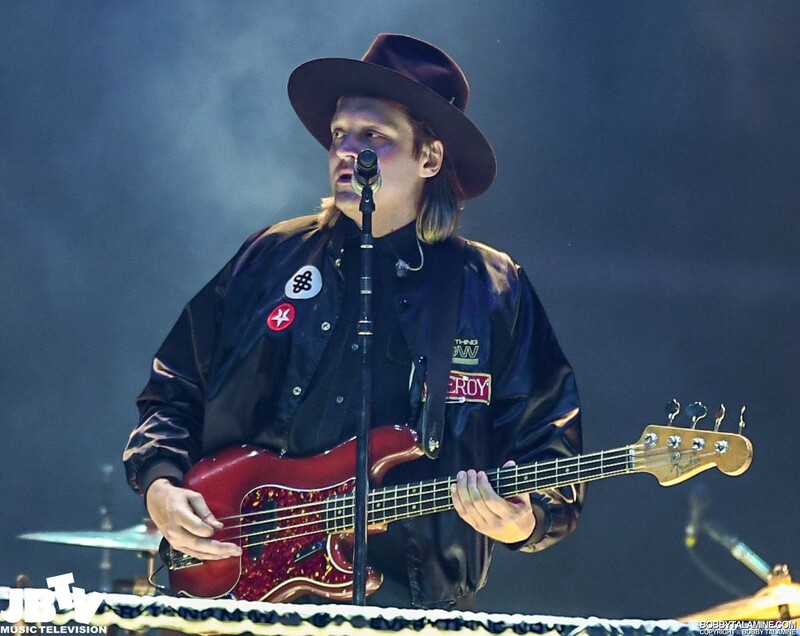 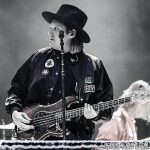 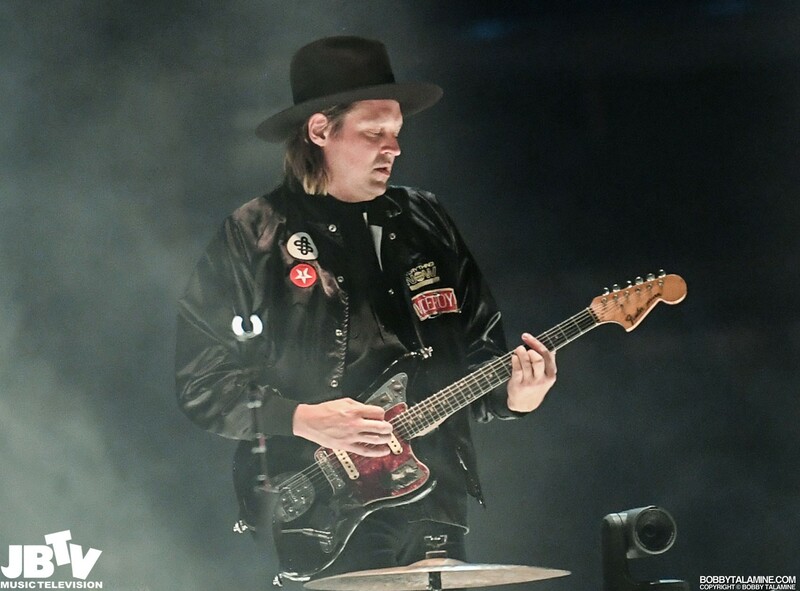 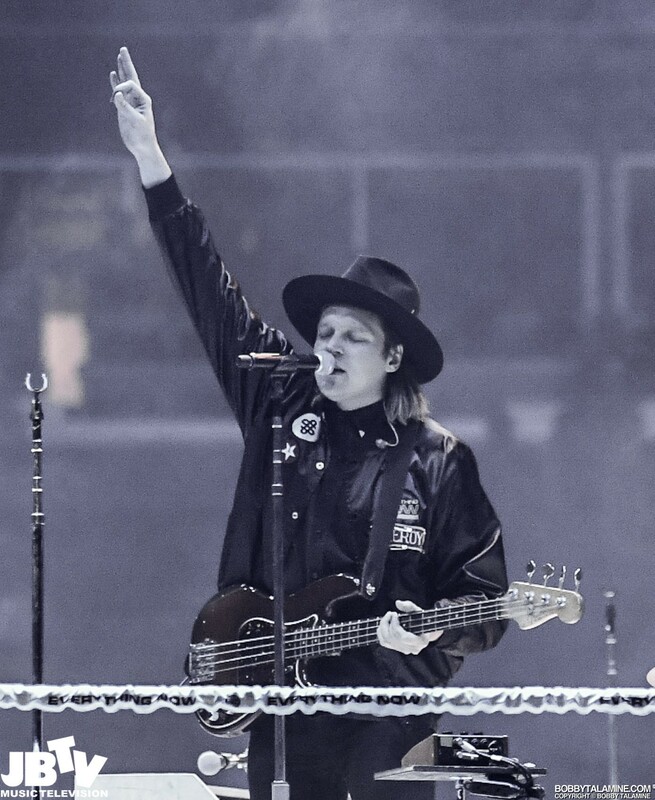 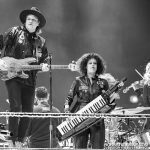 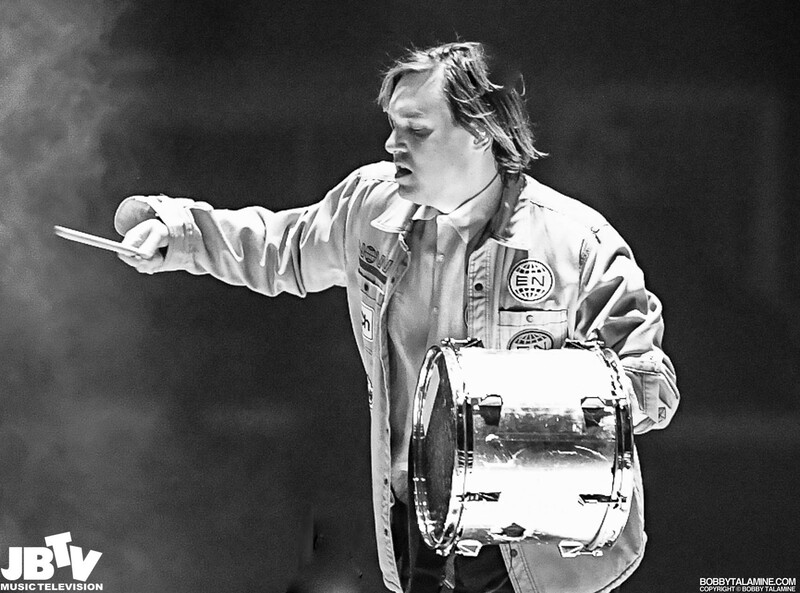 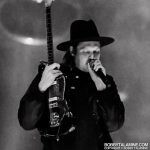 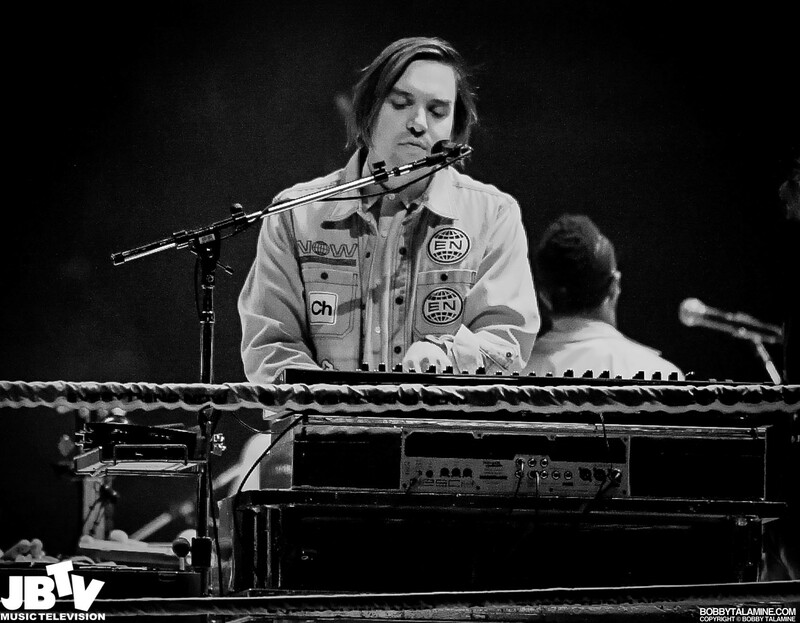 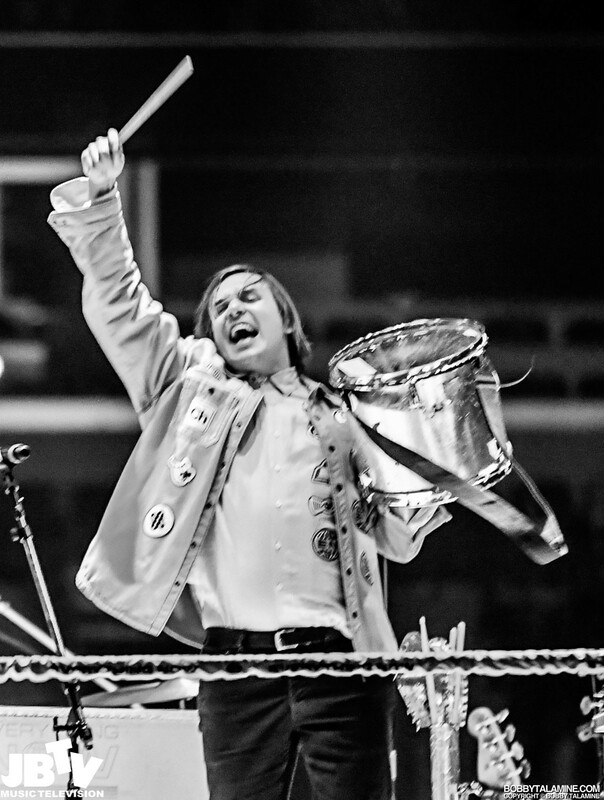 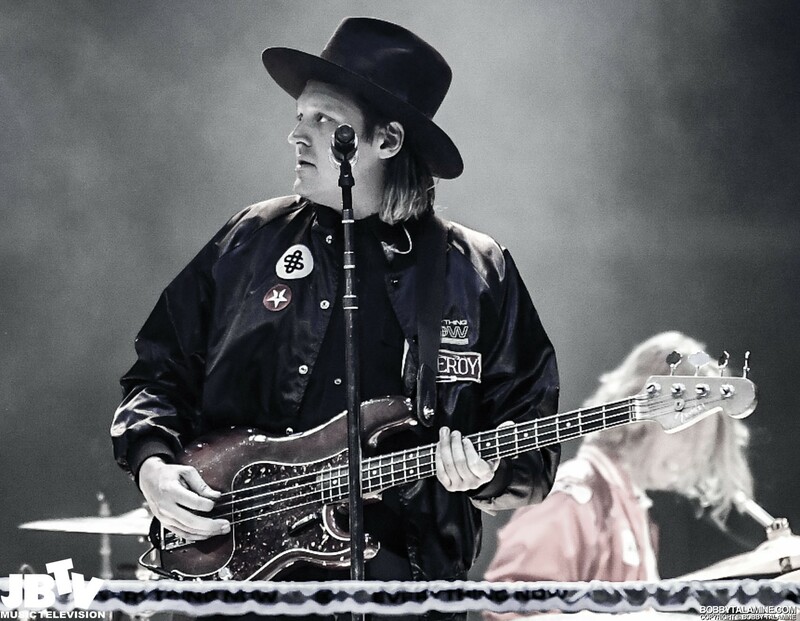 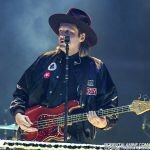 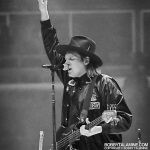 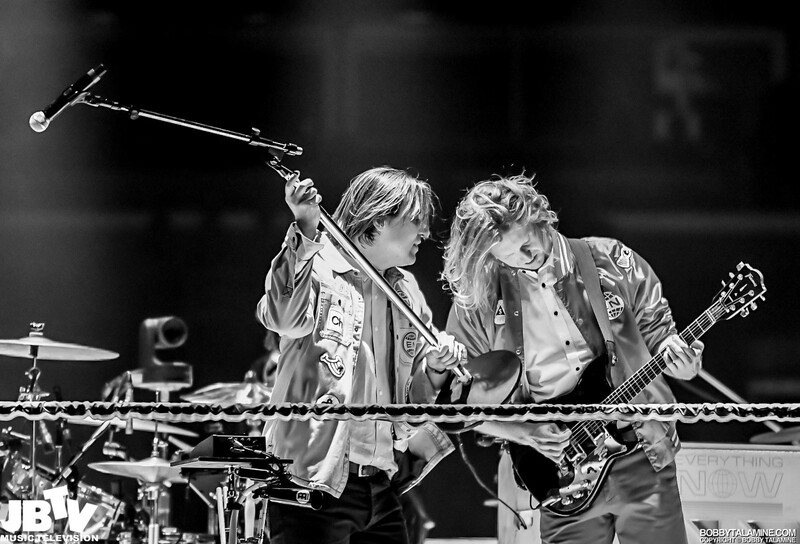 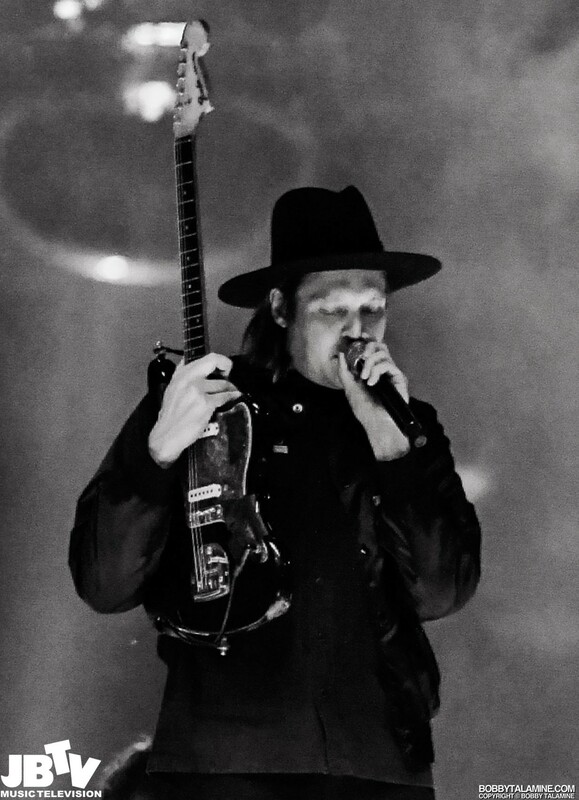 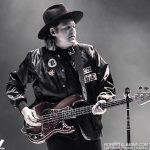 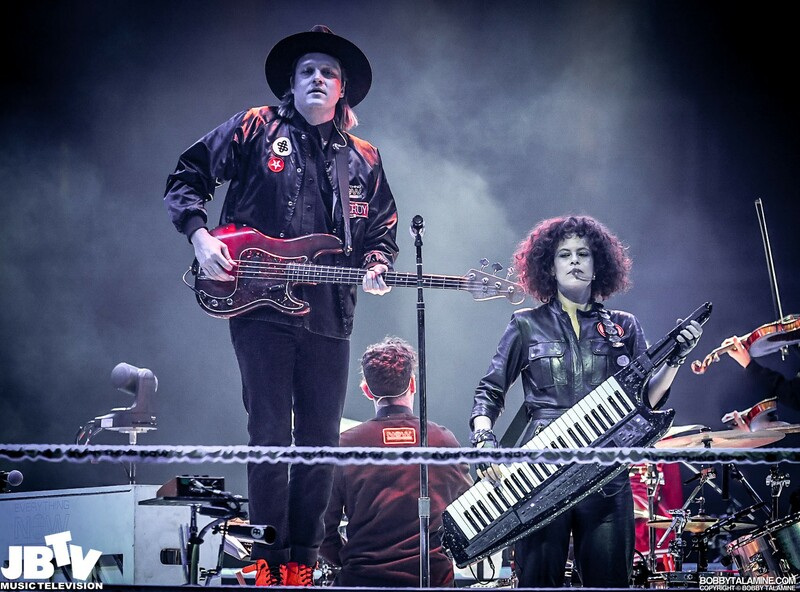 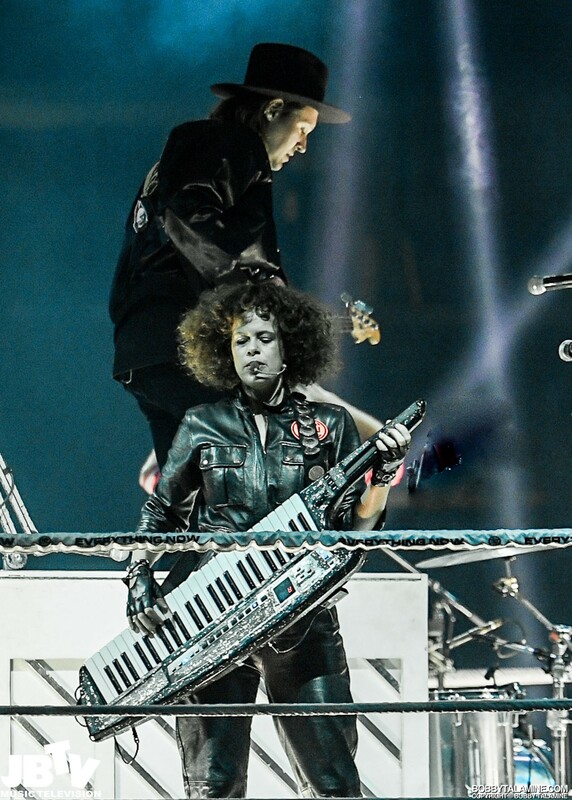 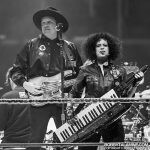 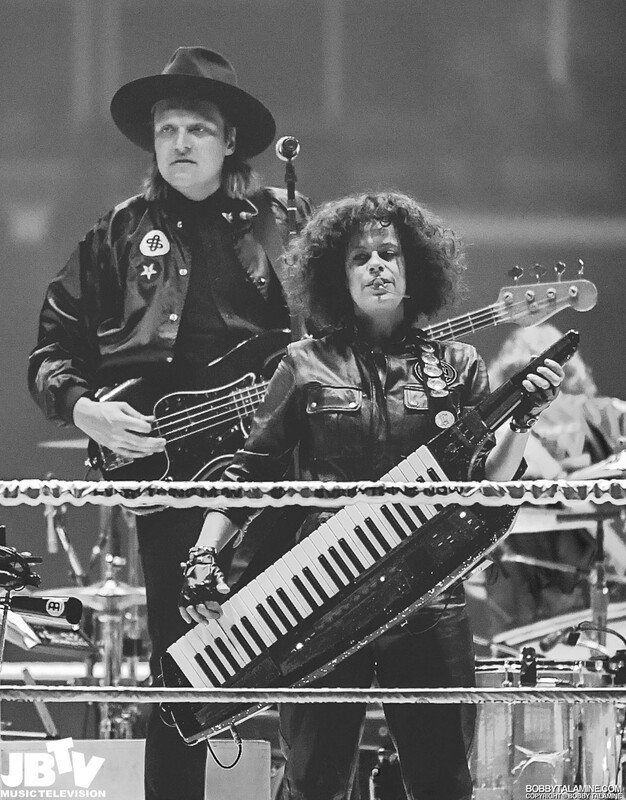 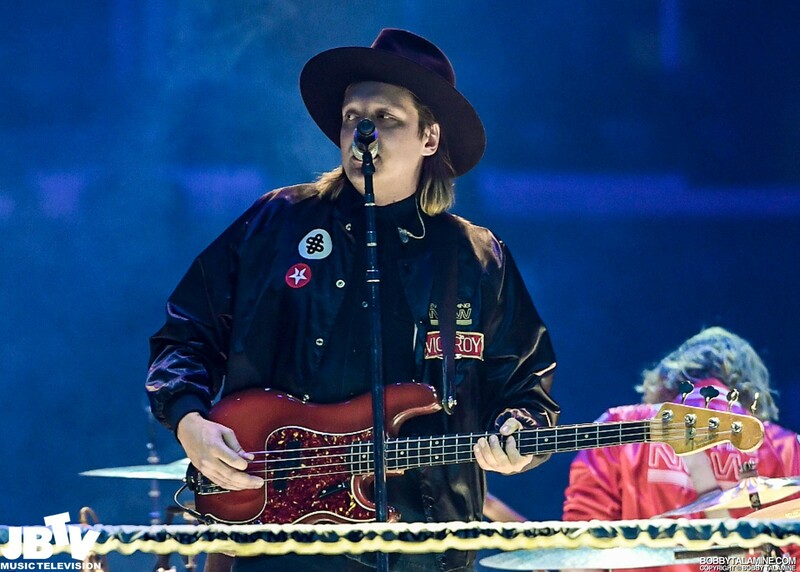 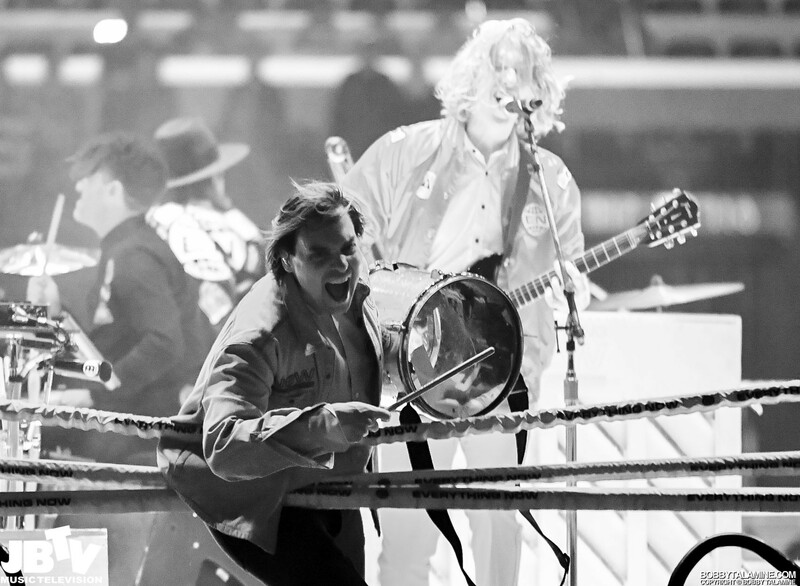 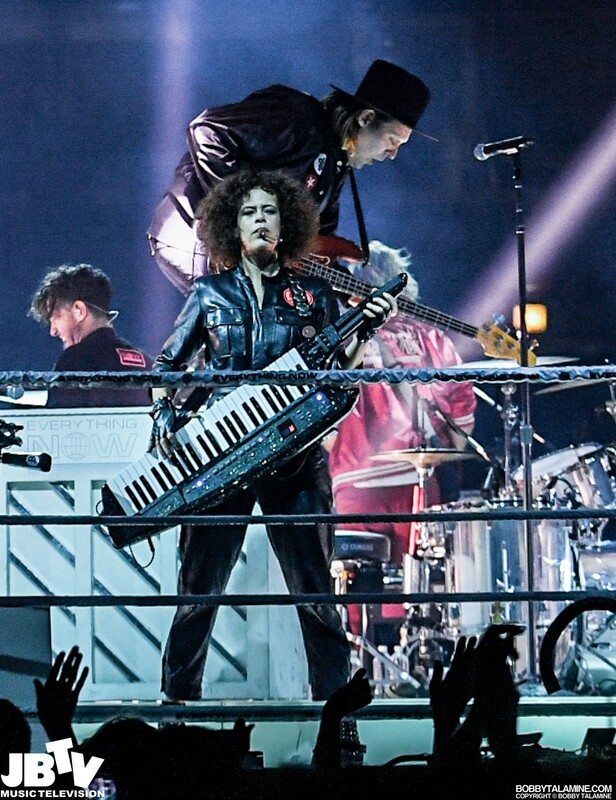 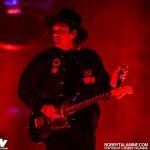 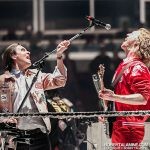 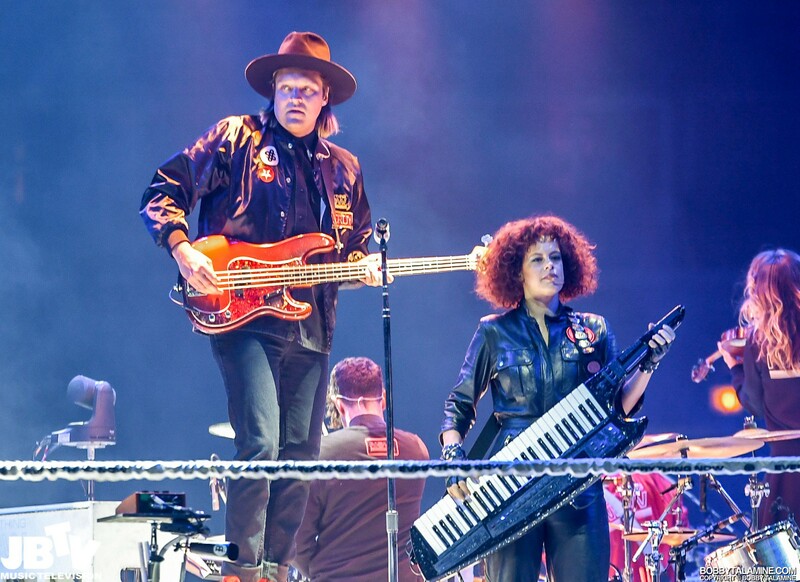 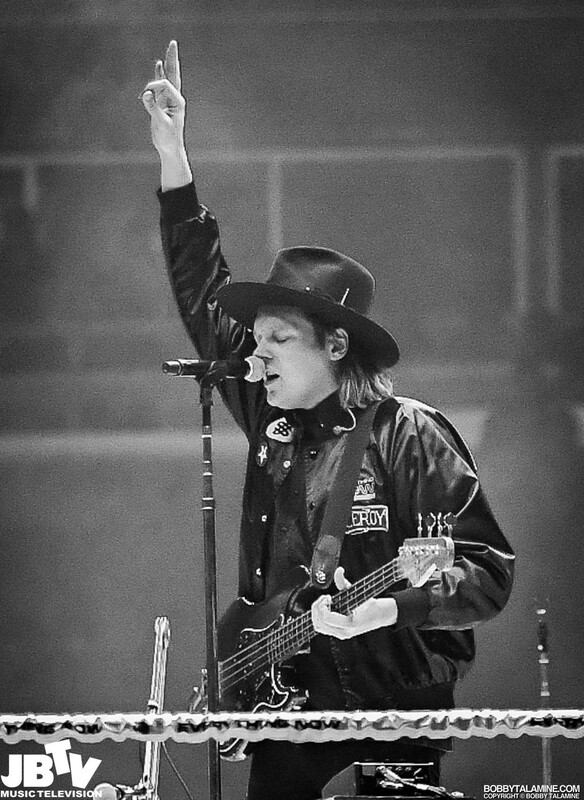 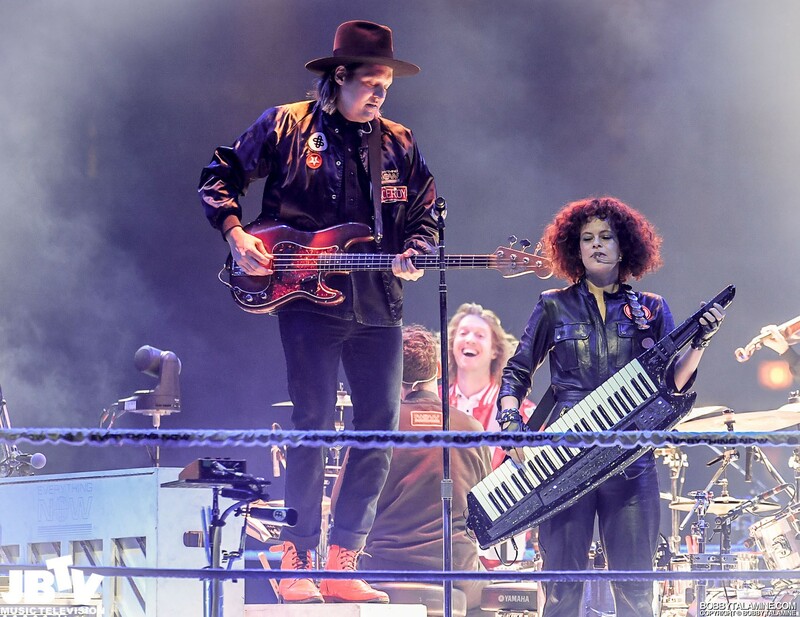 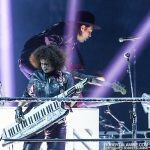 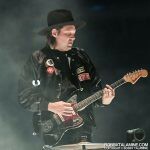 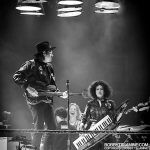 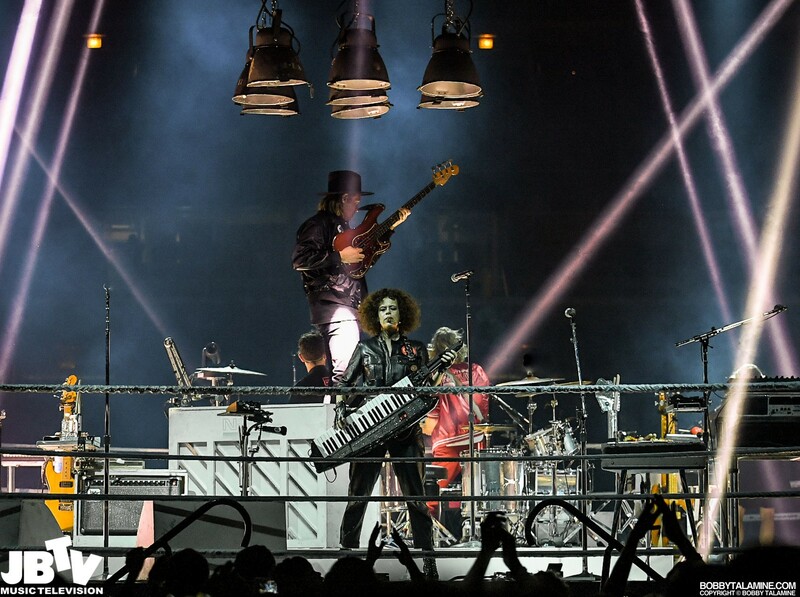 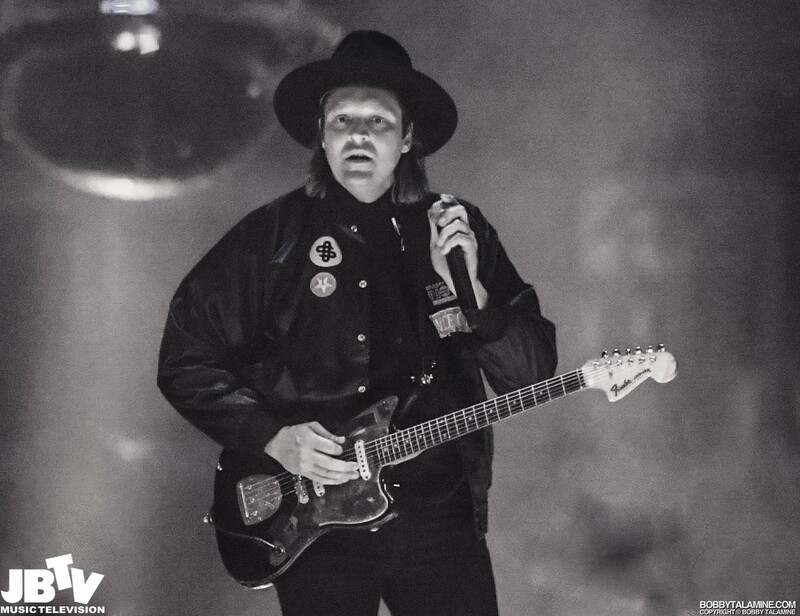 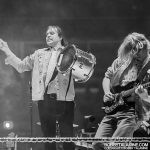 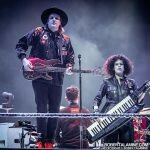 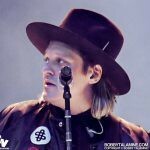 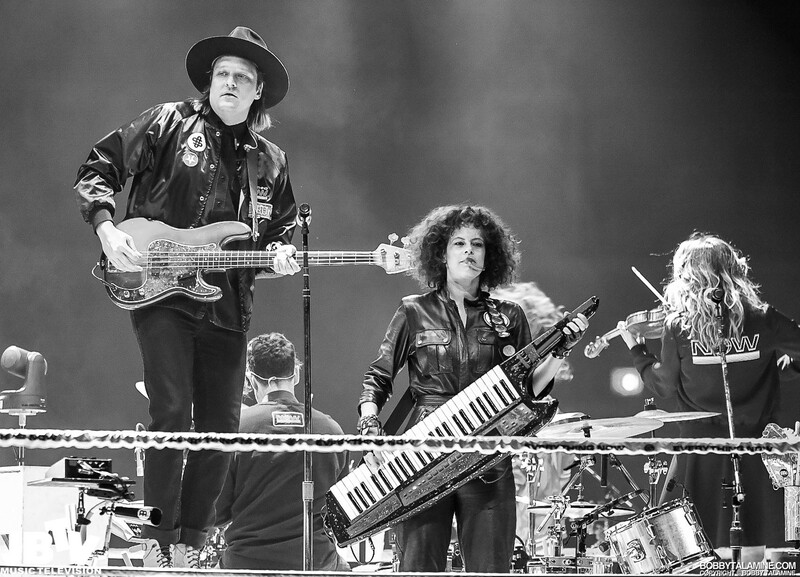 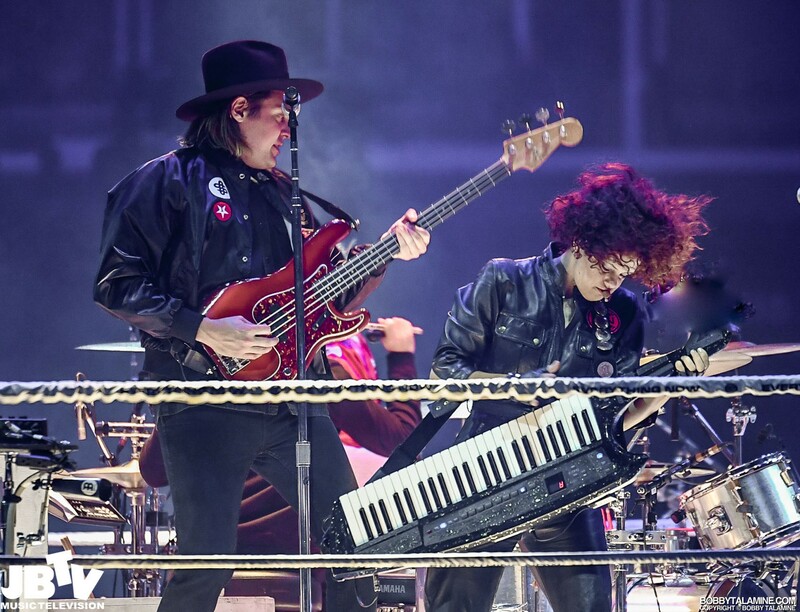 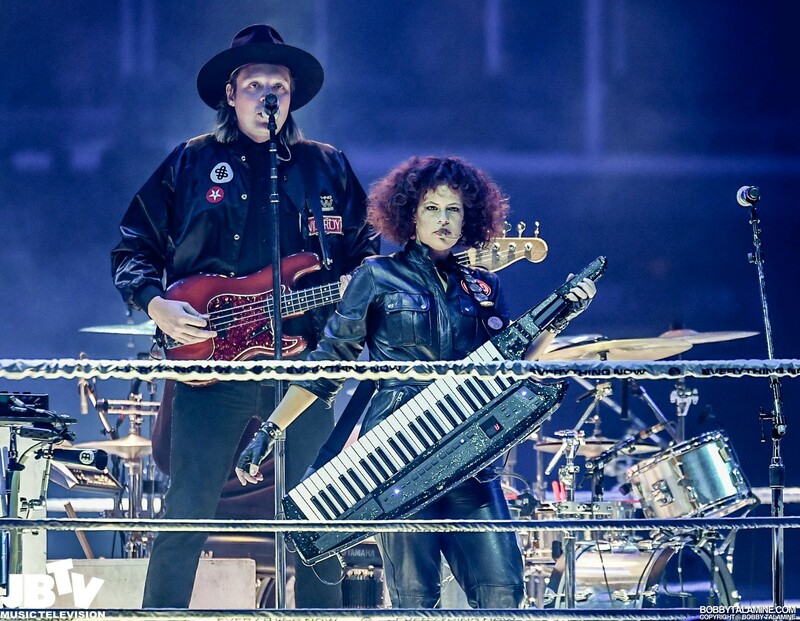 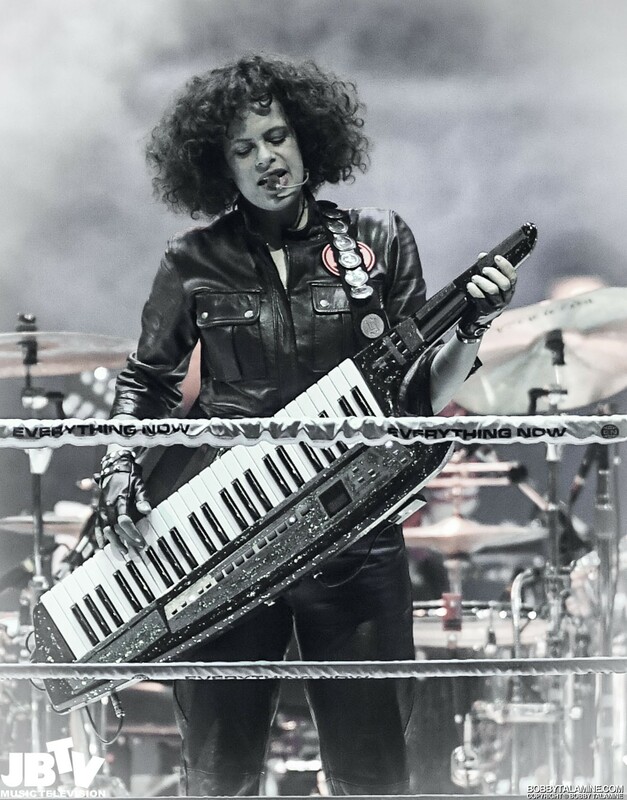 Canadian Indie Rock darlings Arcade Fire and their “Infinite Content” tour make a stop at Chicago’s United Center with special guests The Breeders. 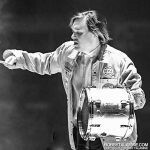 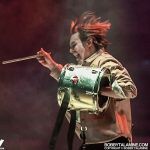 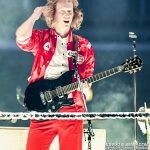 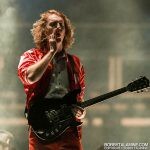 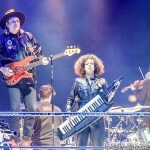 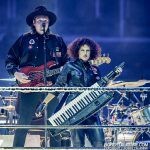 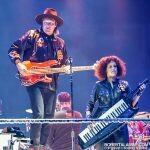 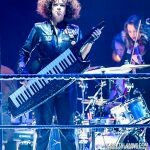 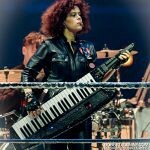 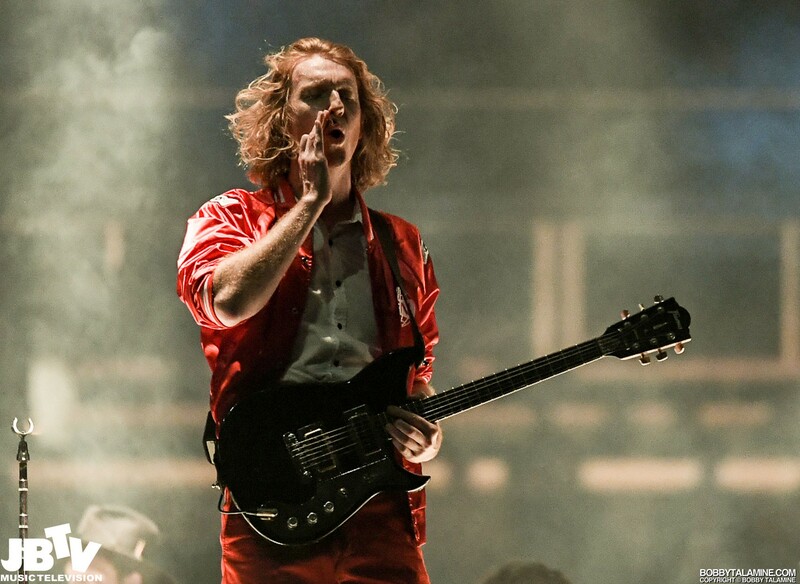 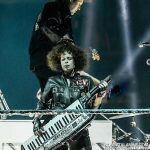 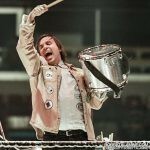 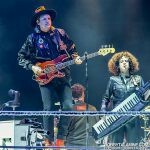 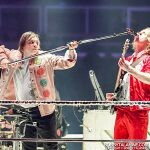 The weapons are out for Arcade Fire, and their latest release “Everything Now”. 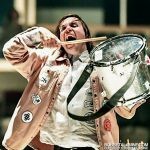 Reviews: mixed – at best. 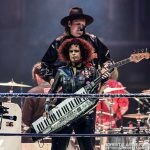 Yes, It’s ambitious and imaginative. 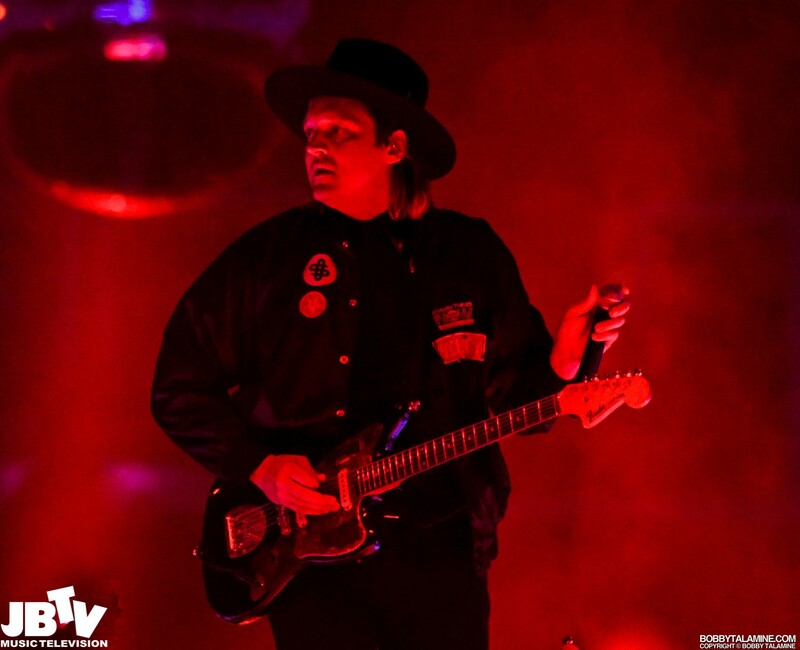 But the album also is lazy sounding and truly uneven at times as well. 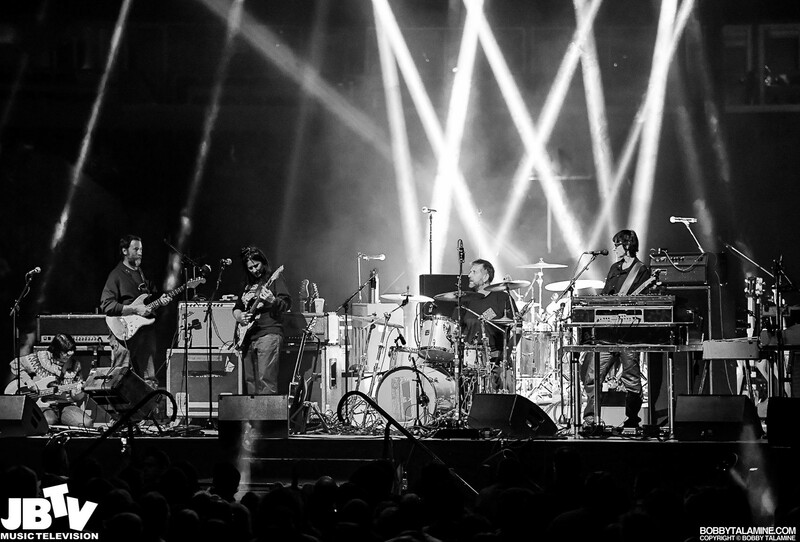 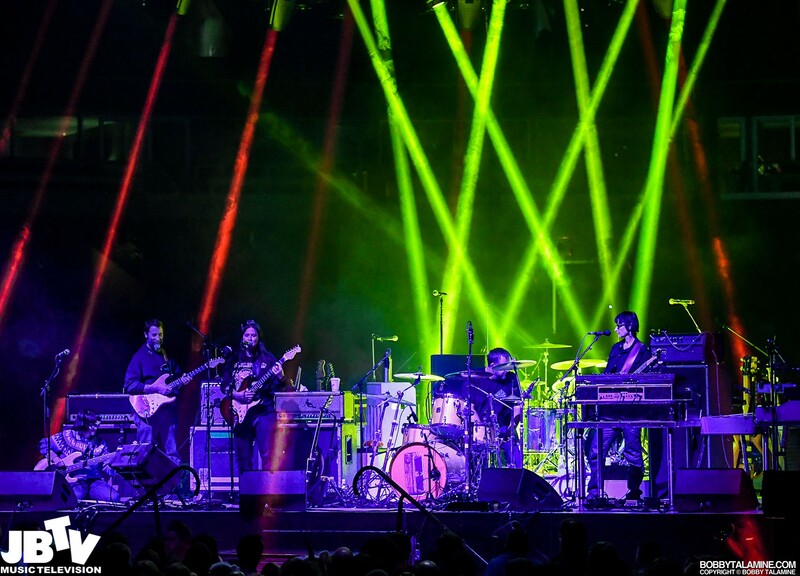 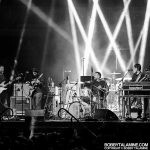 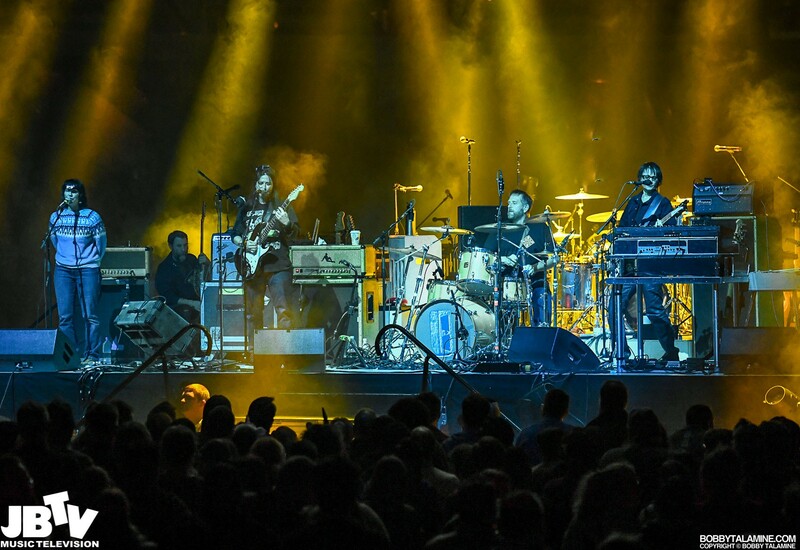 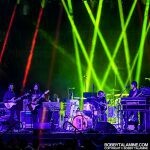 Keep in mind, this a forward thinking Grammy winning band that has developed over the past few years a stature that is almost unequalled in fan reverie. 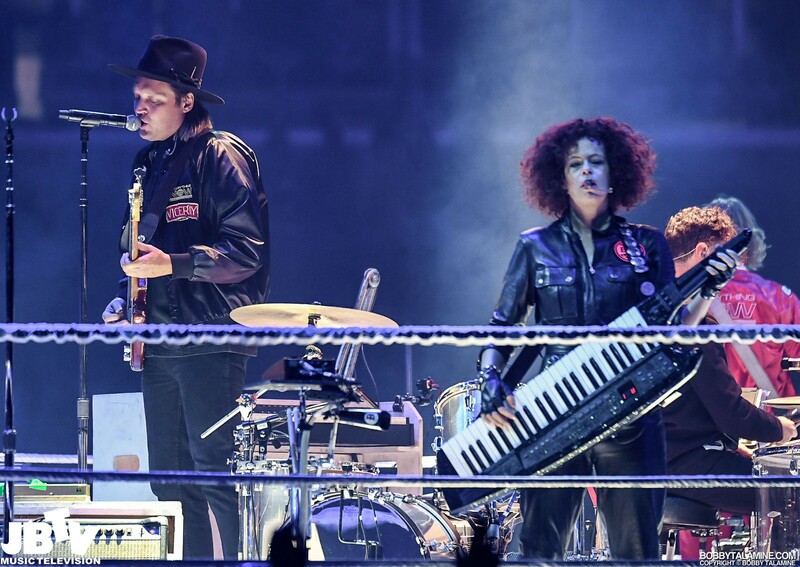 So Arcade Fire performing live, and in the round at Chicago’s United Center, in a boxing ring no less, with pre show announcements similar to a prize fighters, with a boxing ring bell to start the show- held by Win Butler and “Dinged” by Regine Chassagne – you’d think that the show would start off guns blazing and punches thrown to get the fight off to a good start. 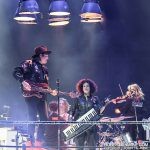 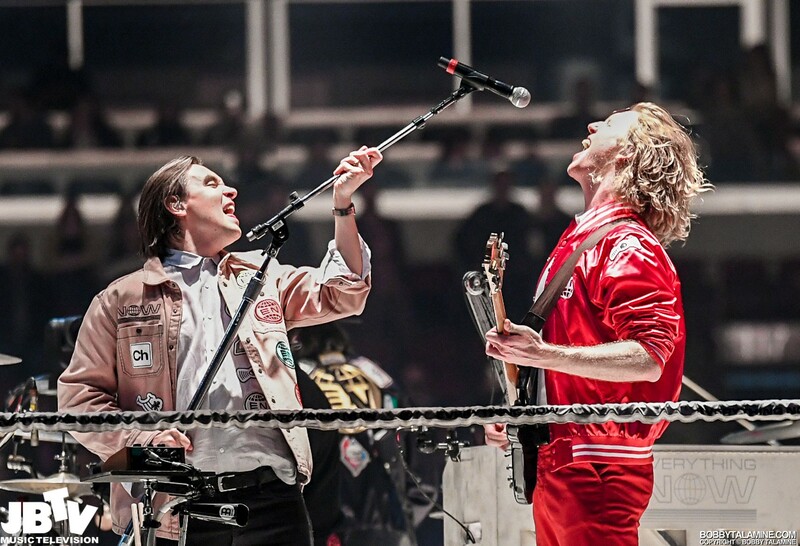 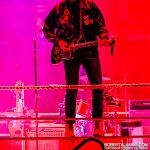 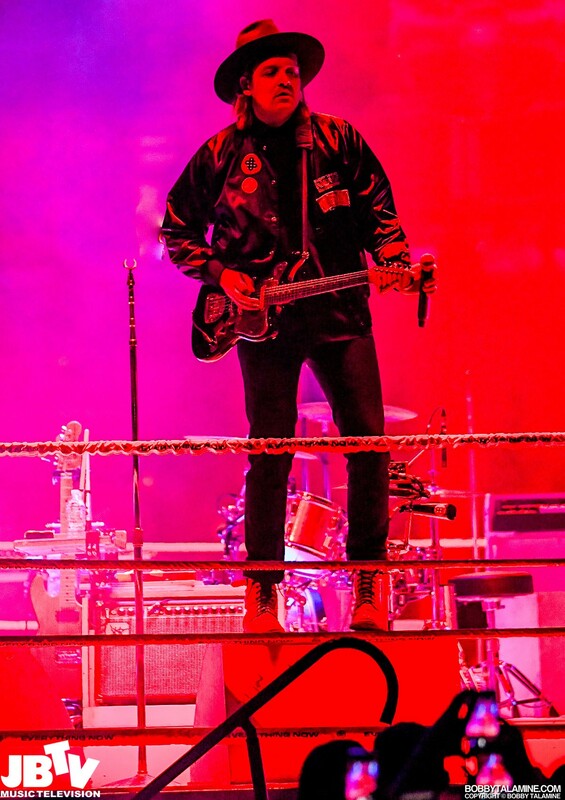 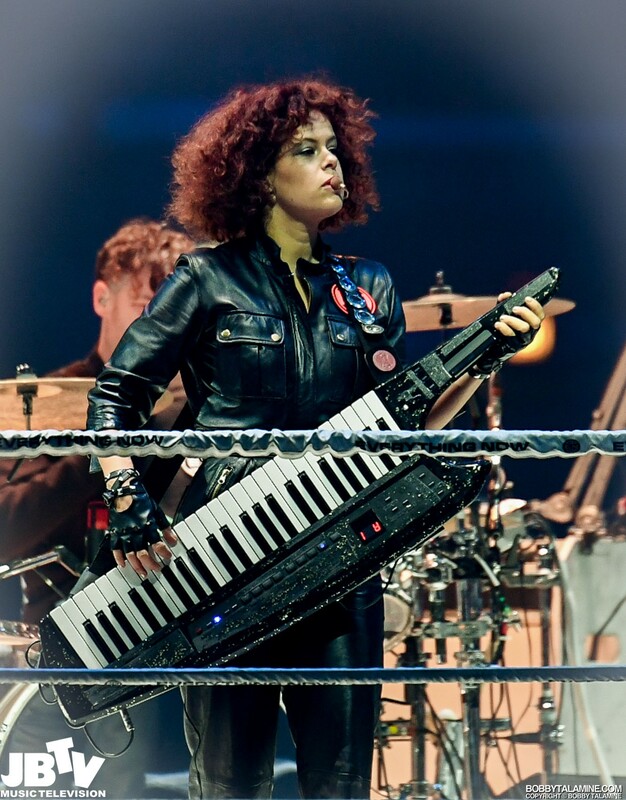 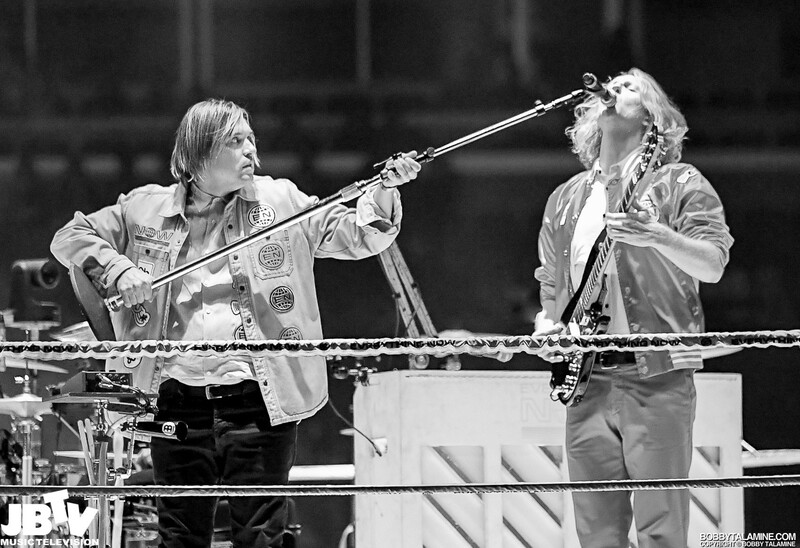 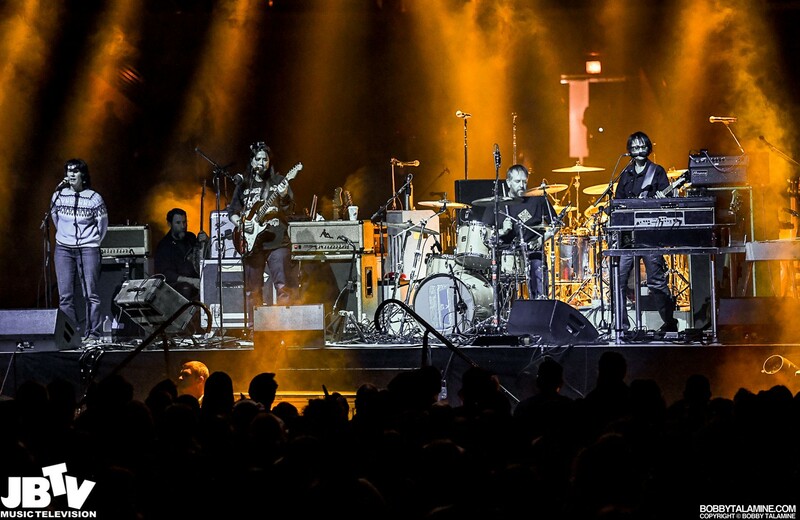 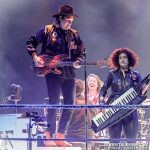 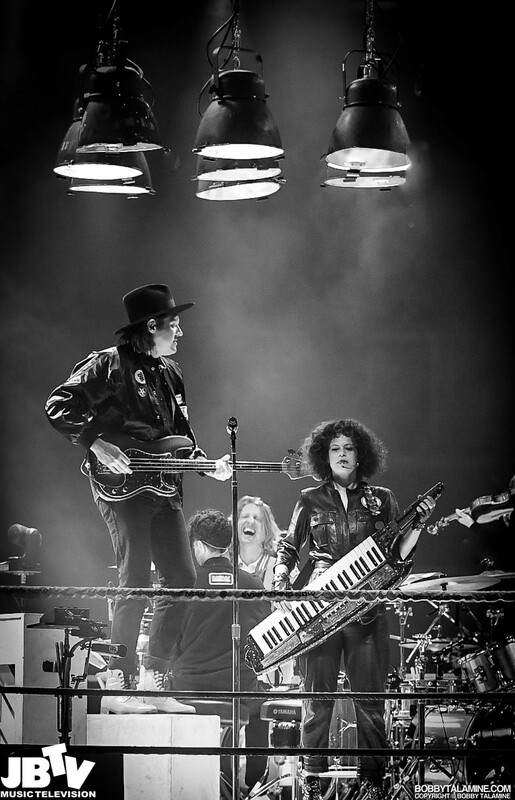 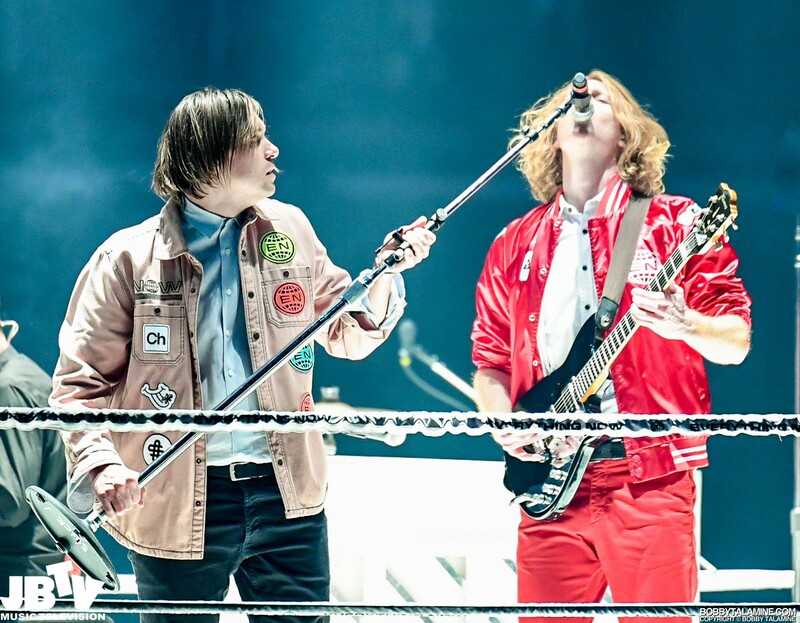 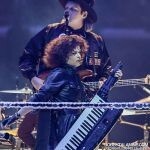 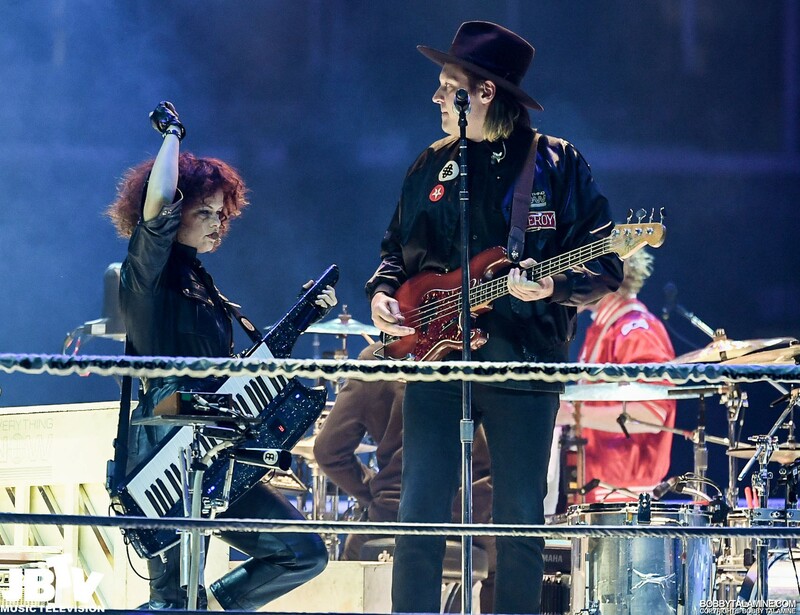 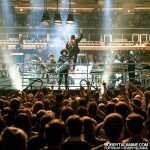 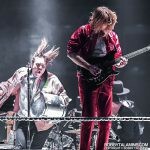 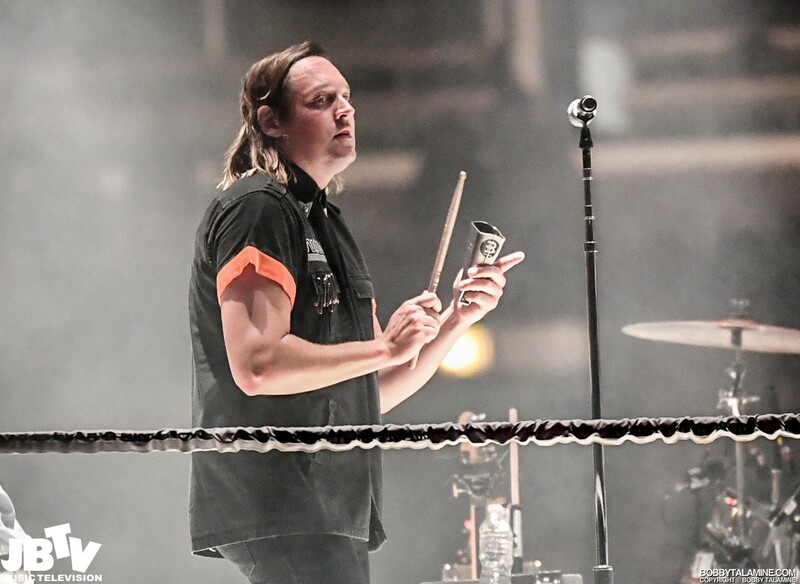 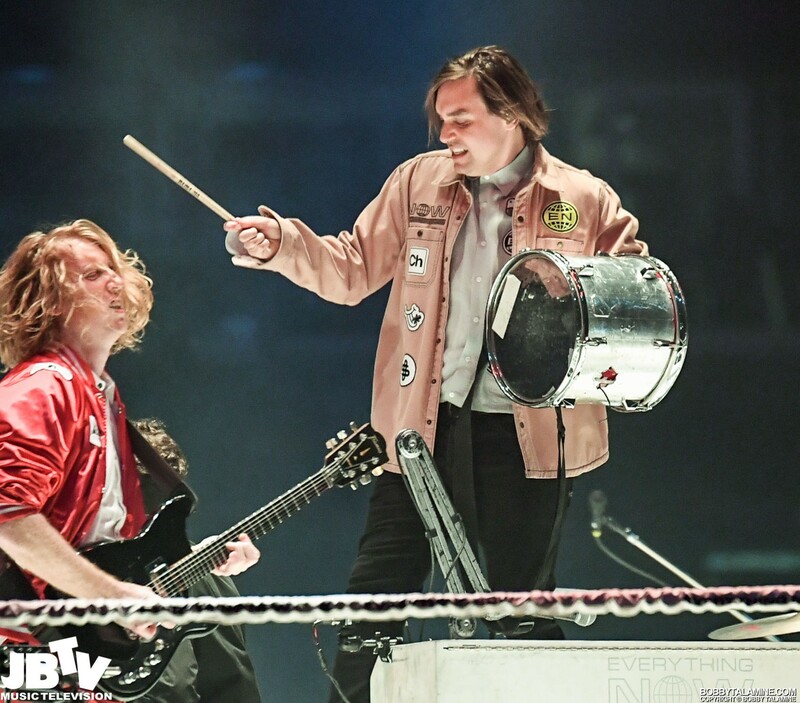 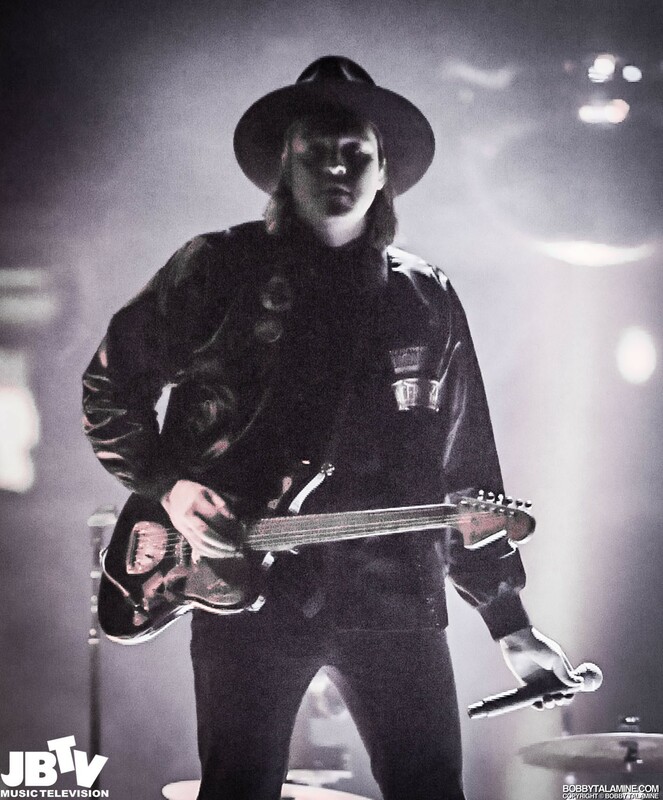 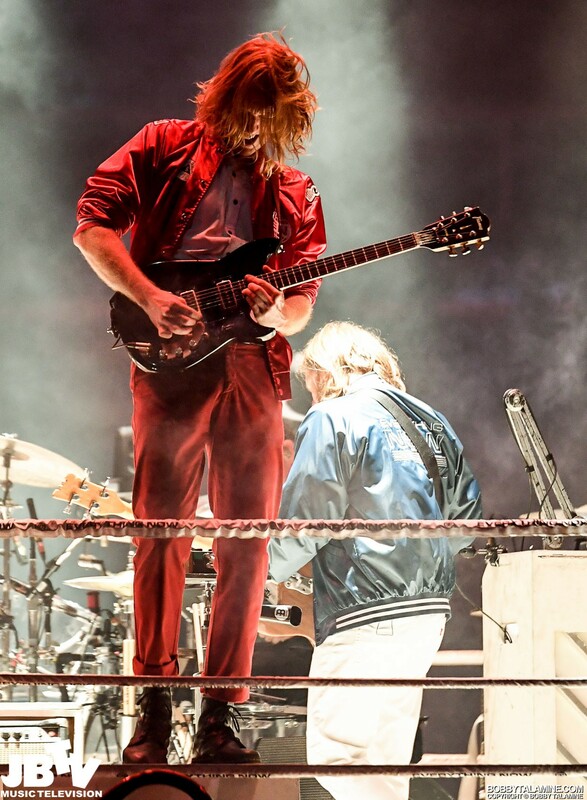 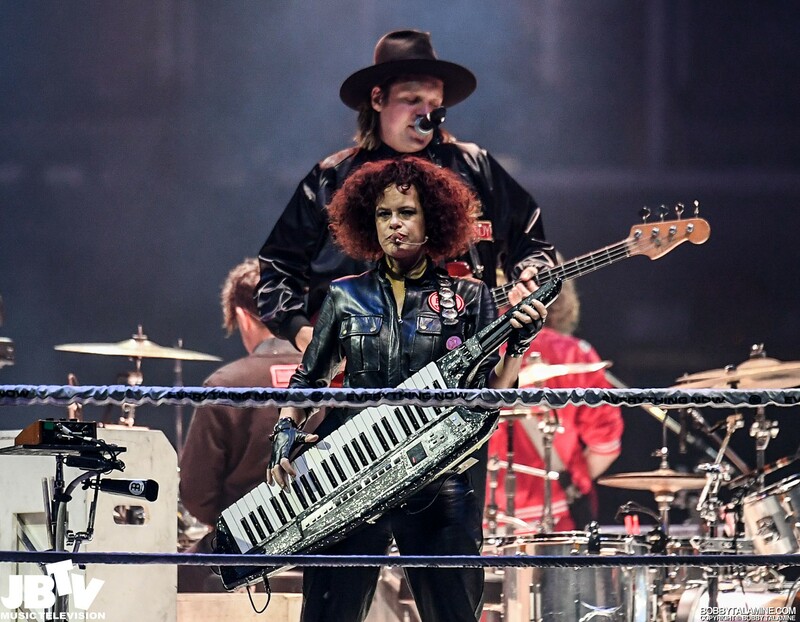 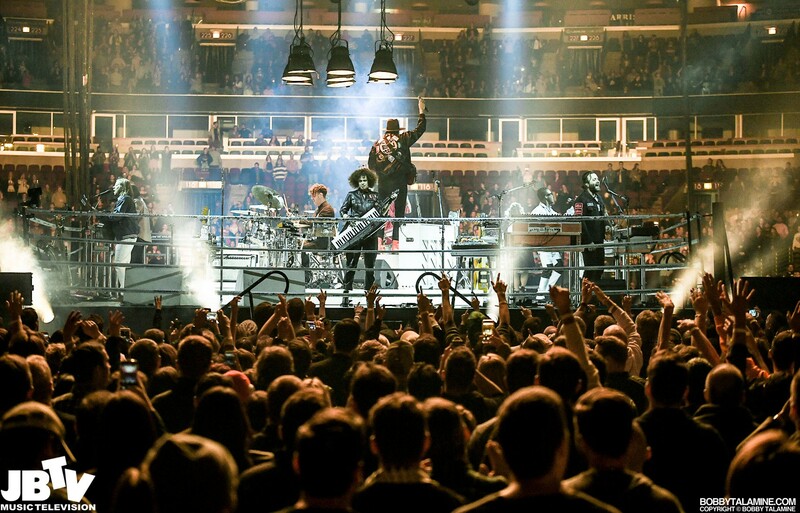 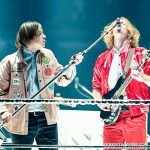 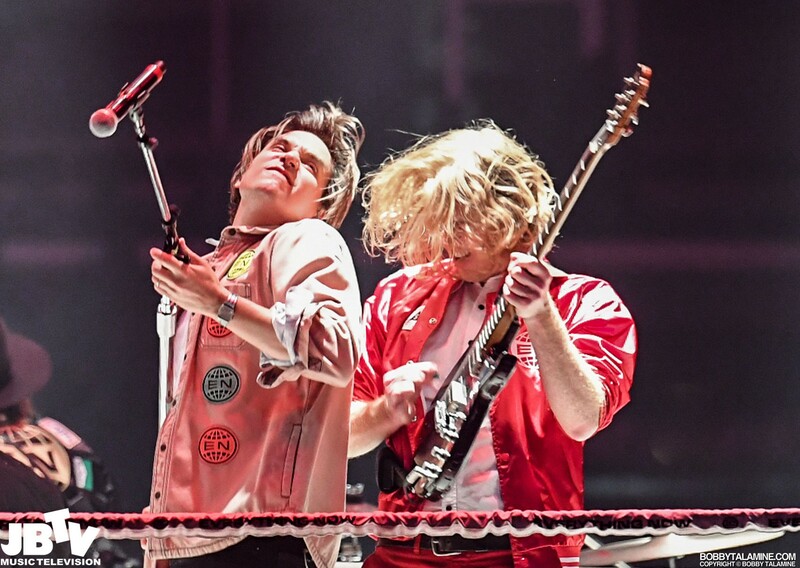 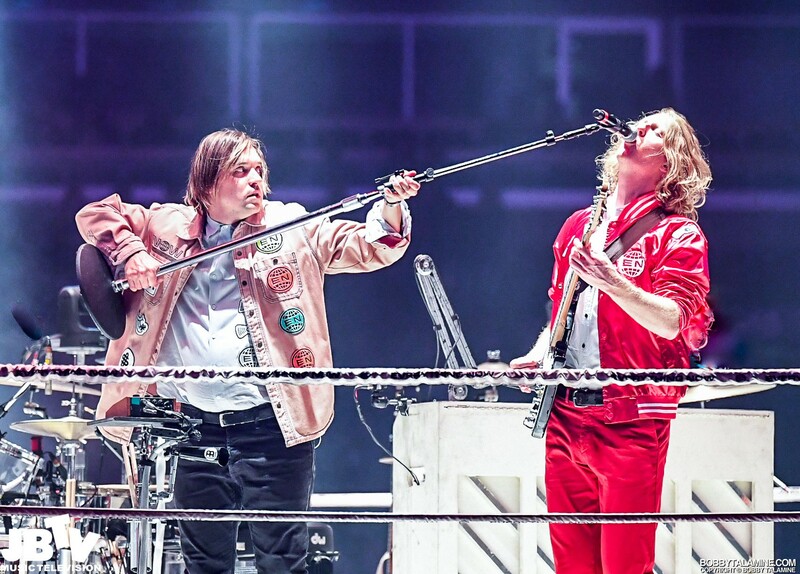 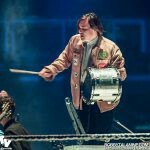 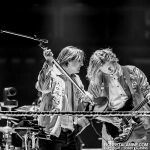 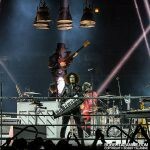 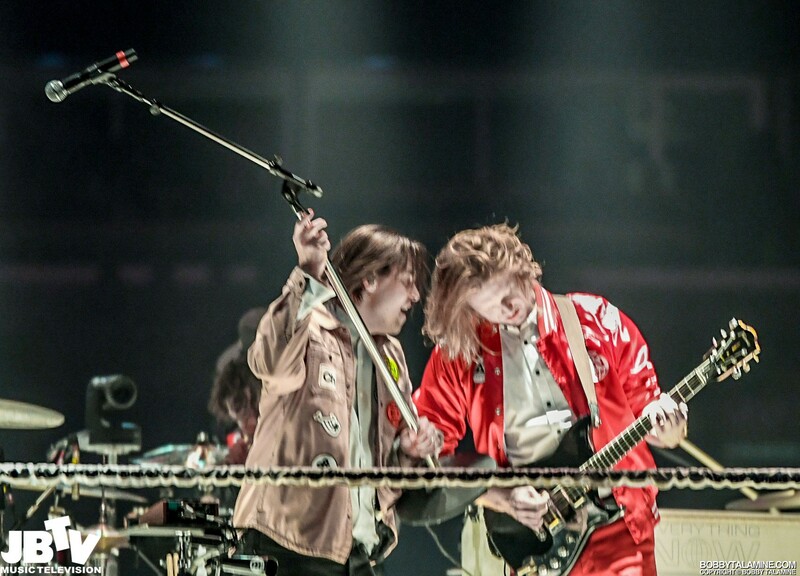 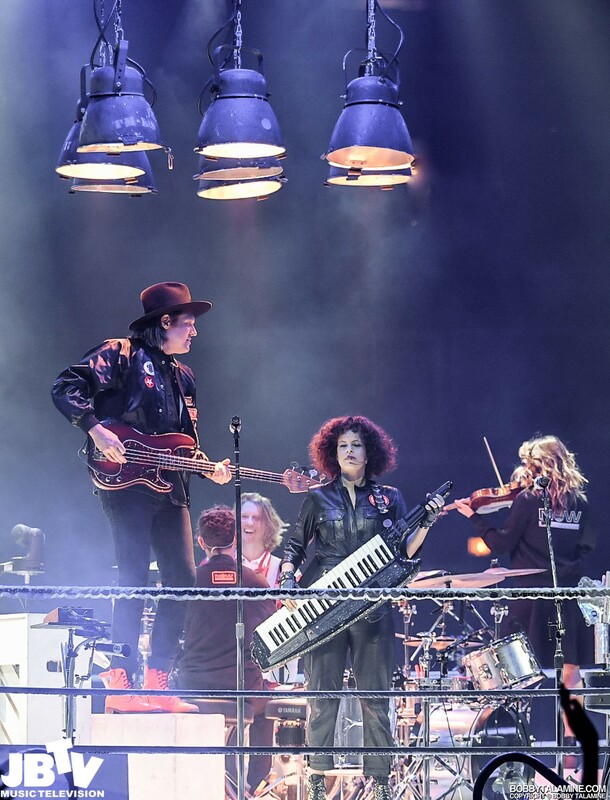 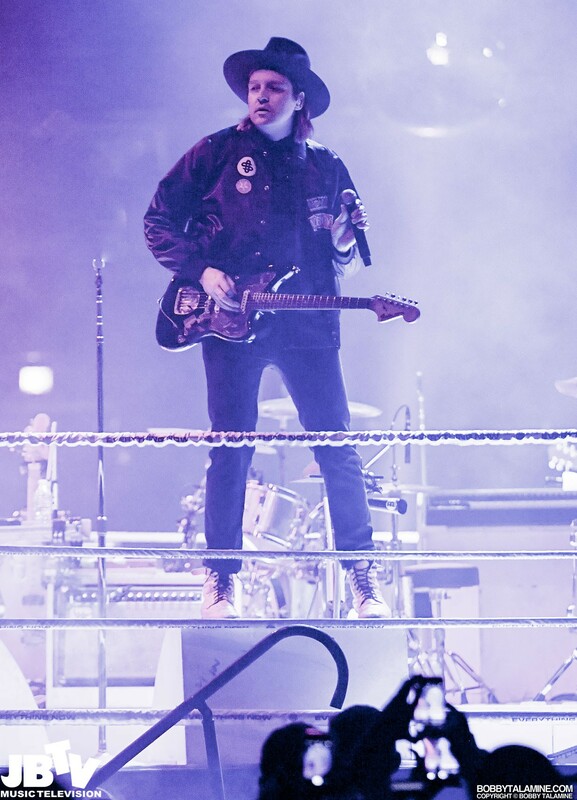 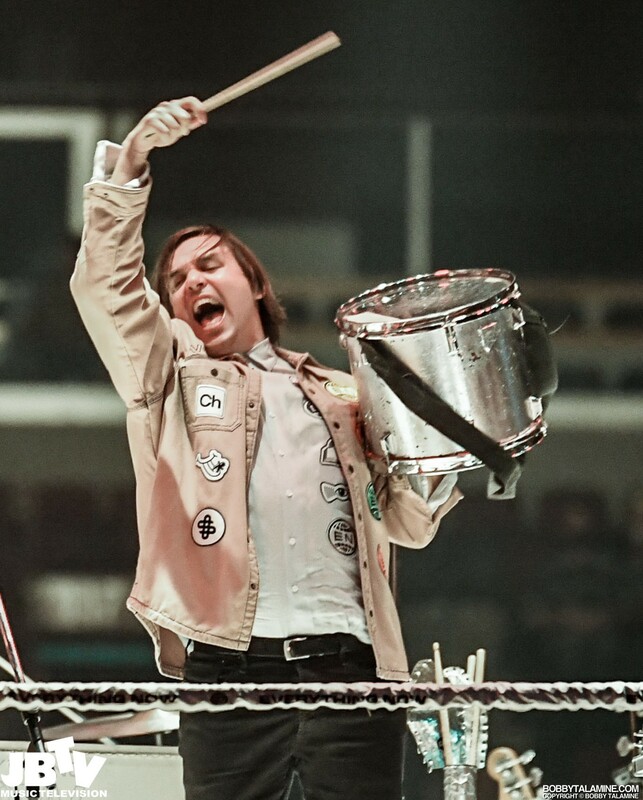 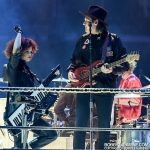 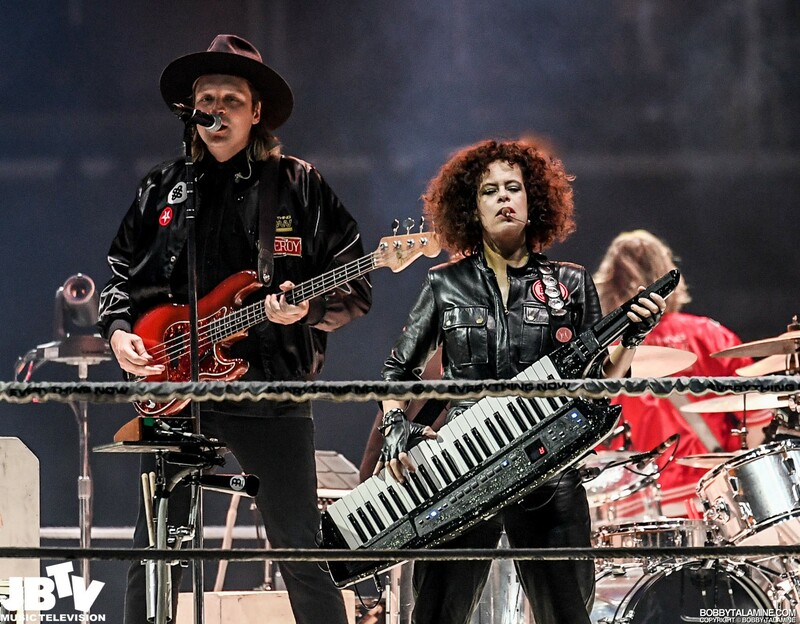 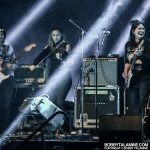 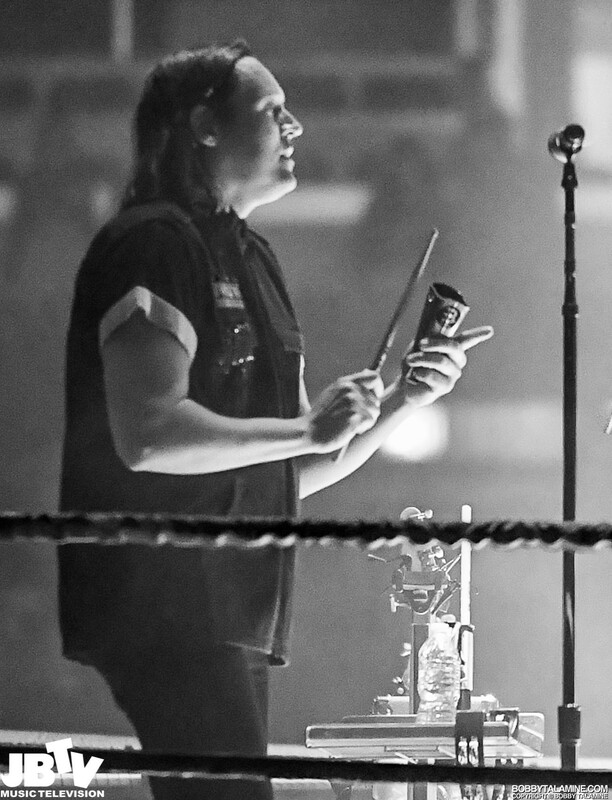 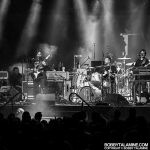 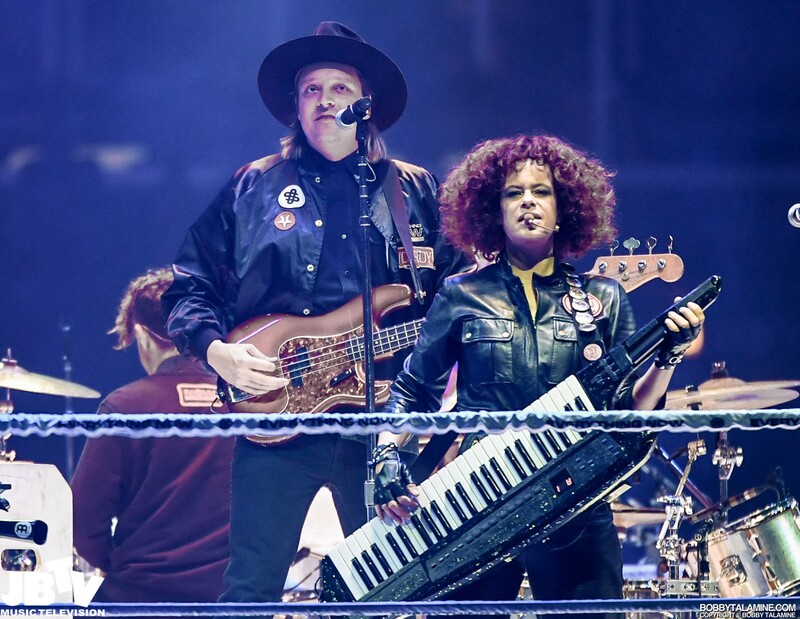 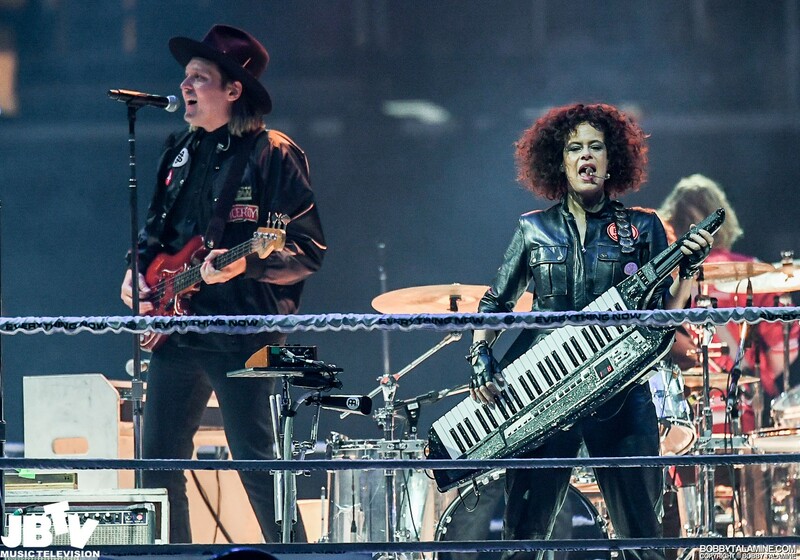 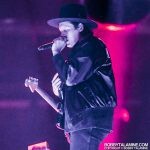 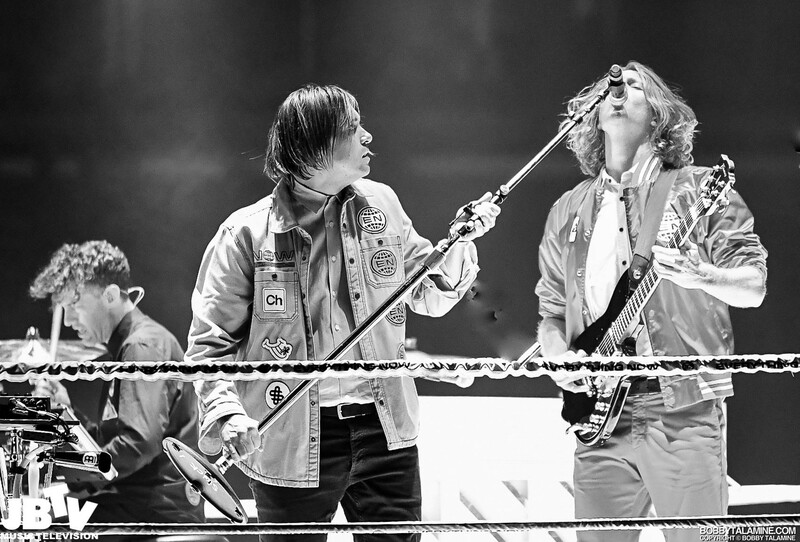 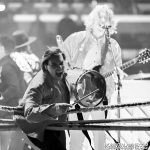 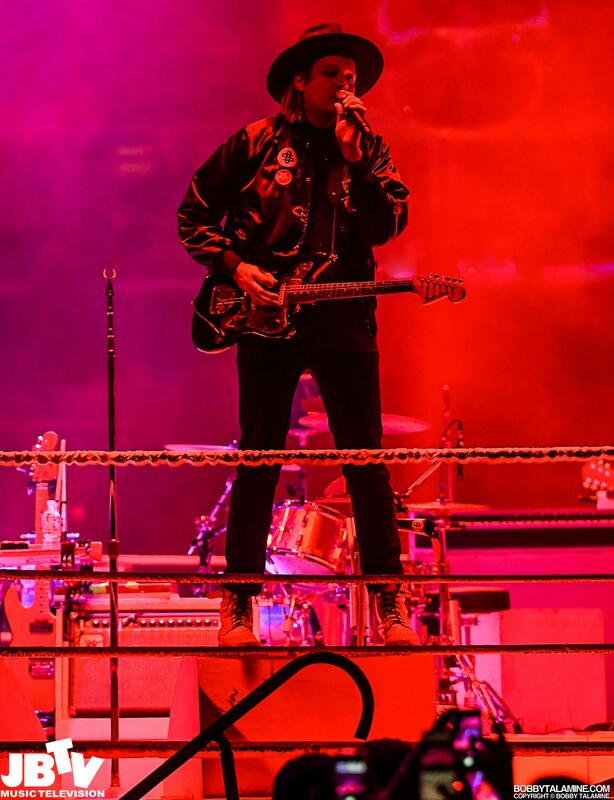 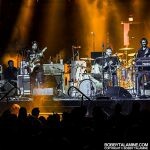 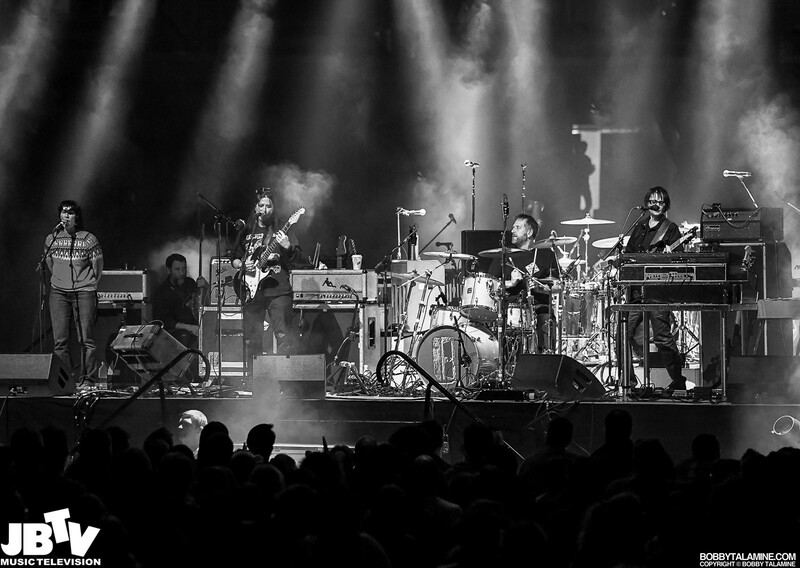 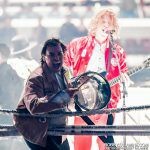 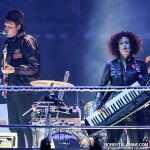 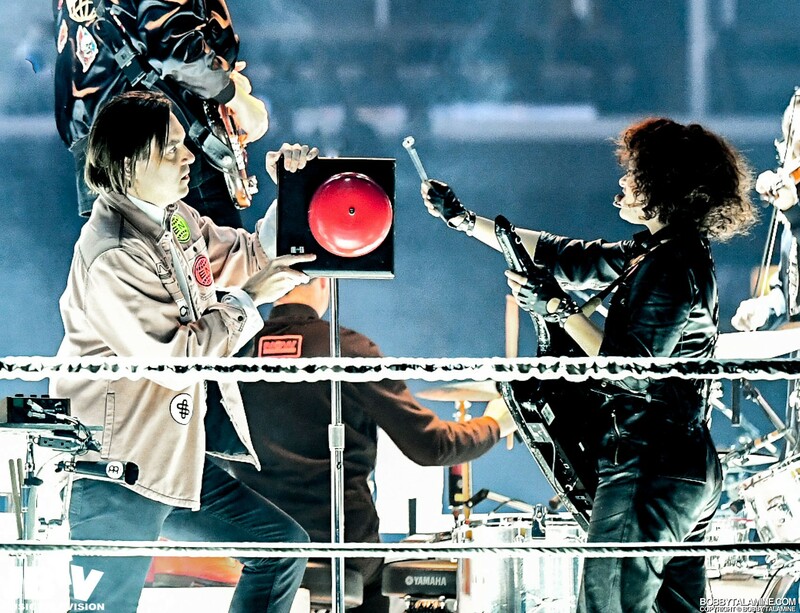 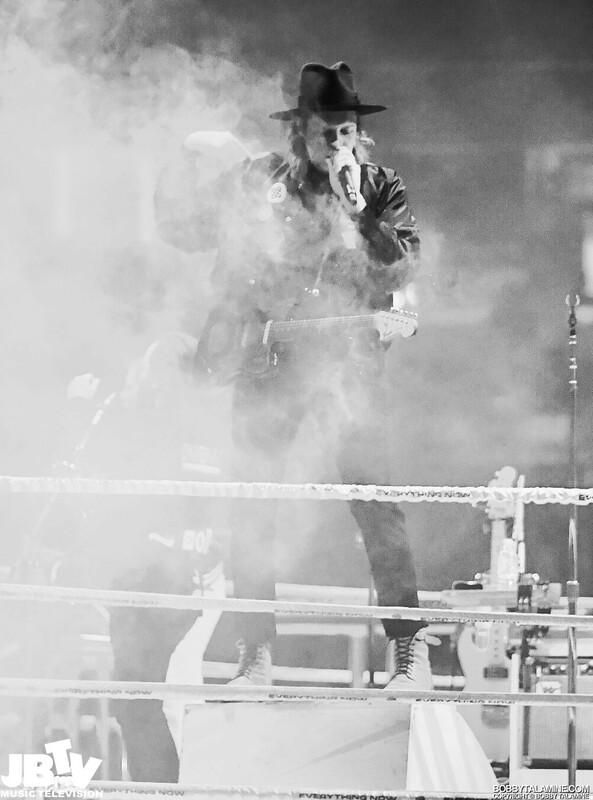 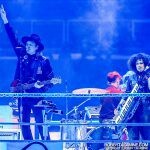 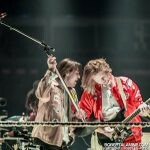 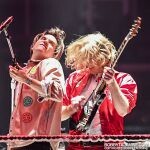 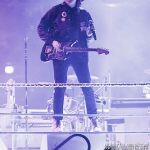 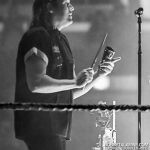 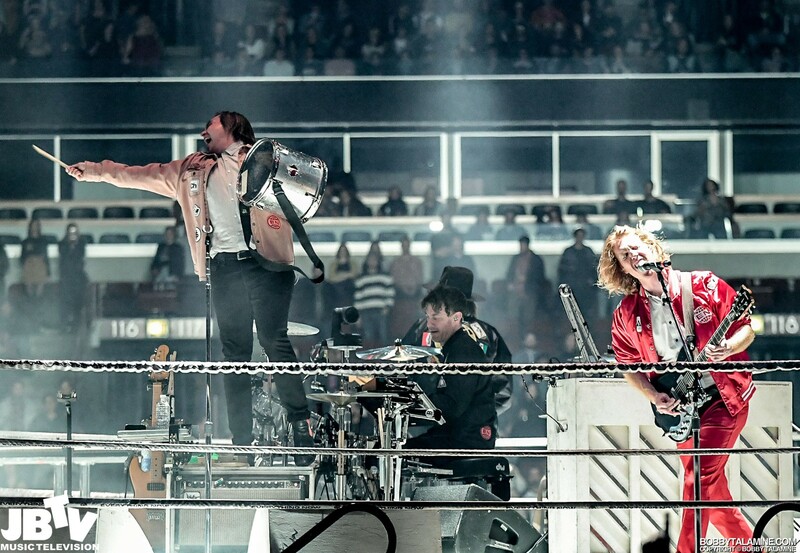 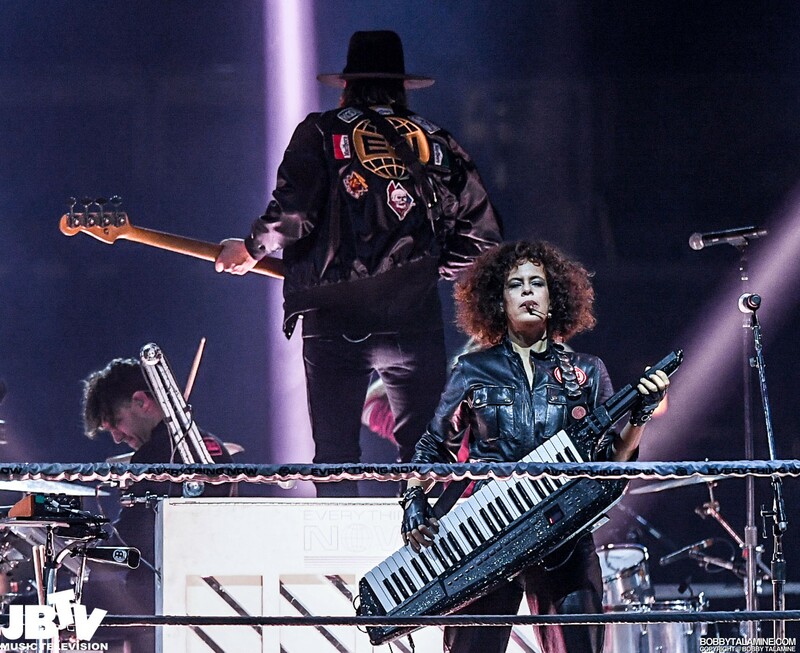 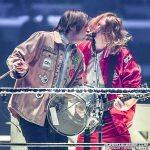 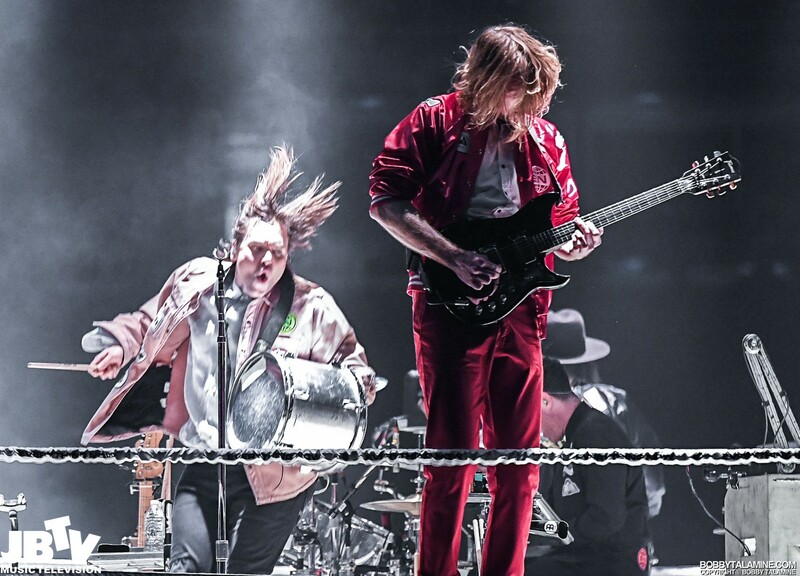 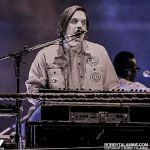 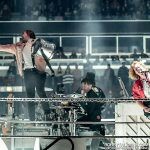 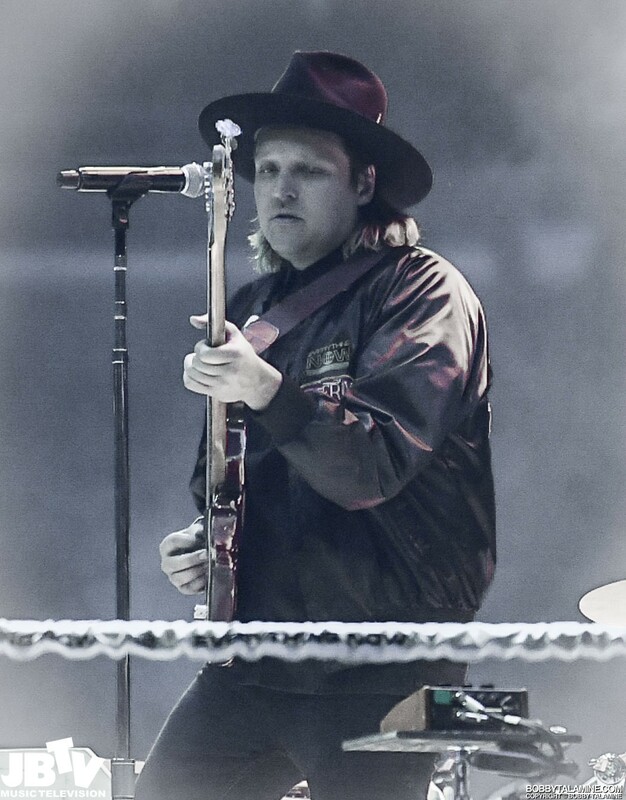 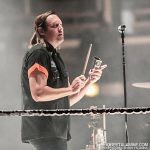 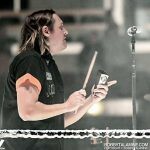 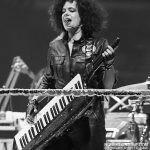 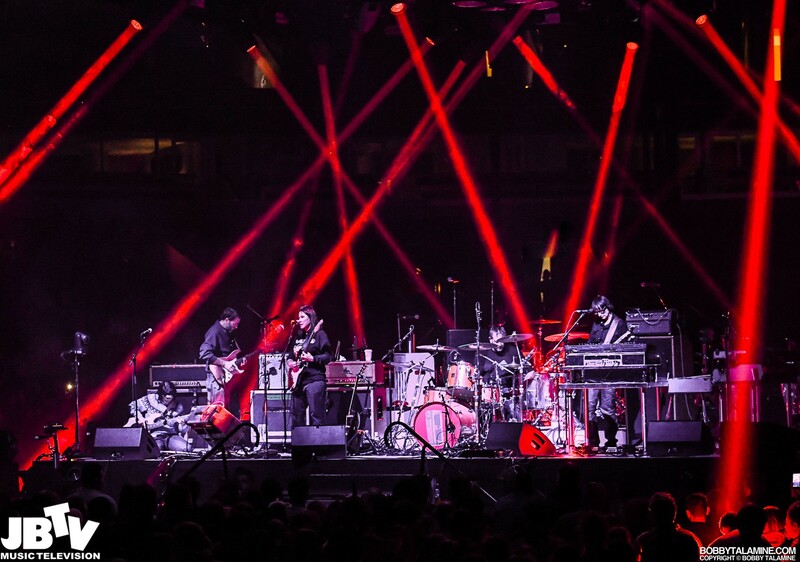 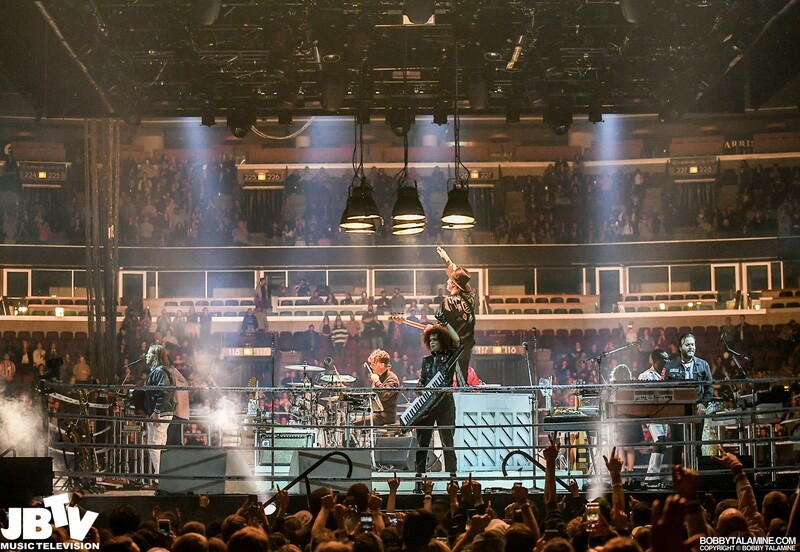 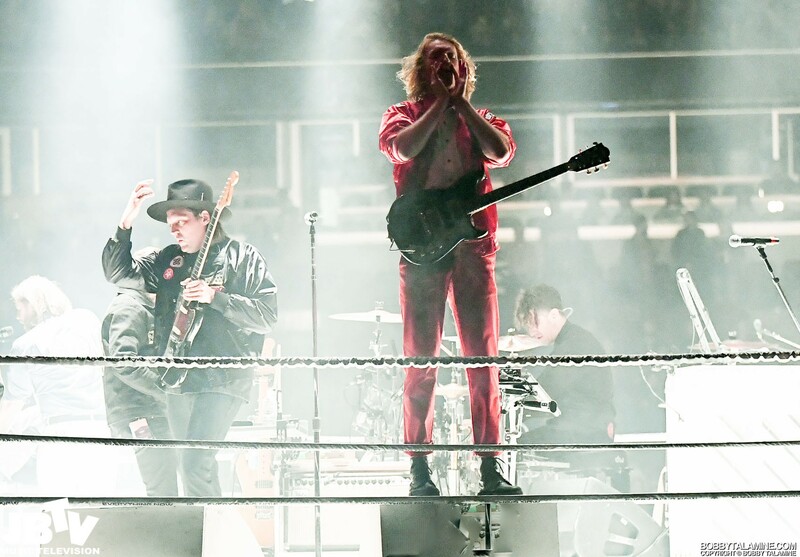 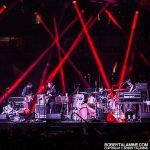 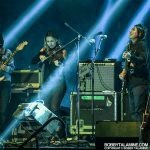 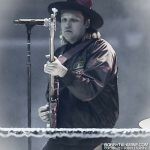 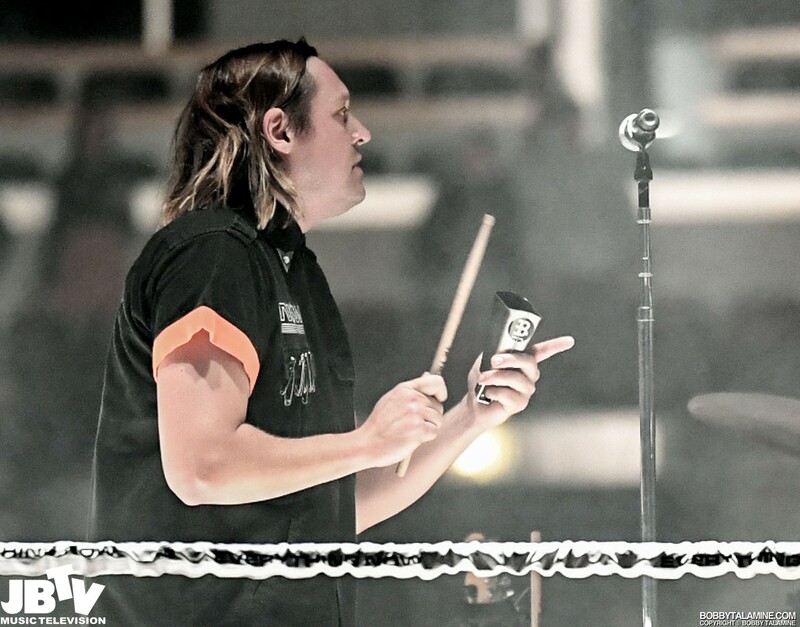 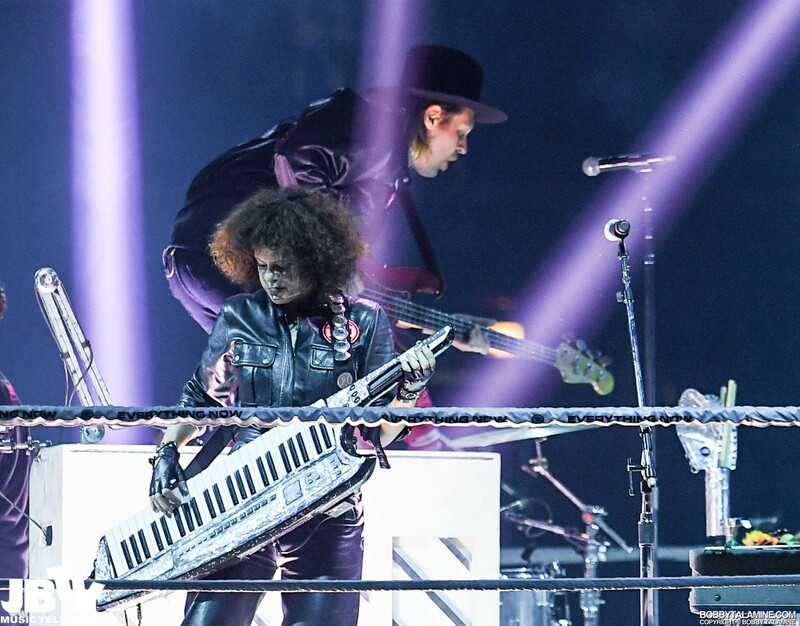 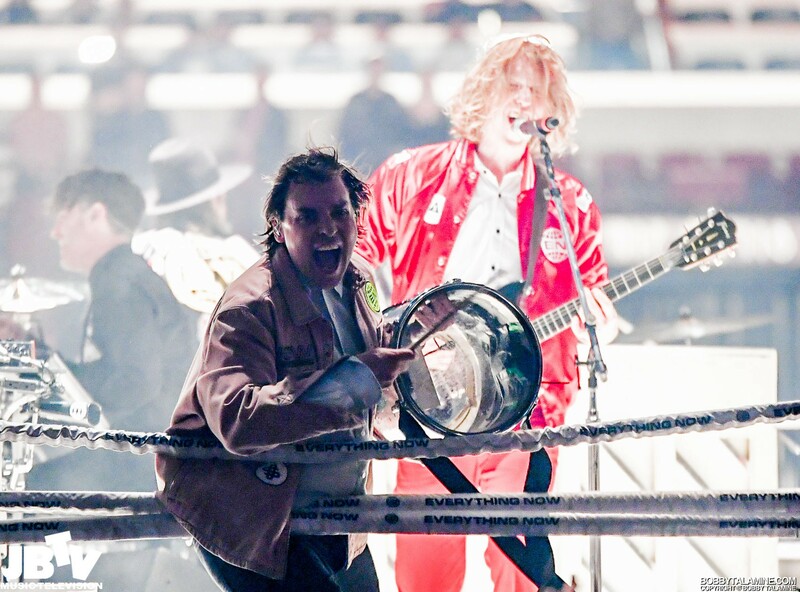 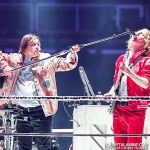 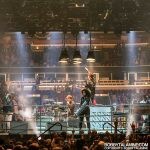 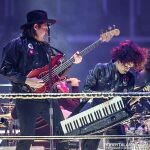 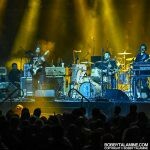 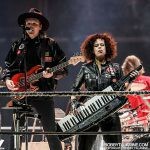 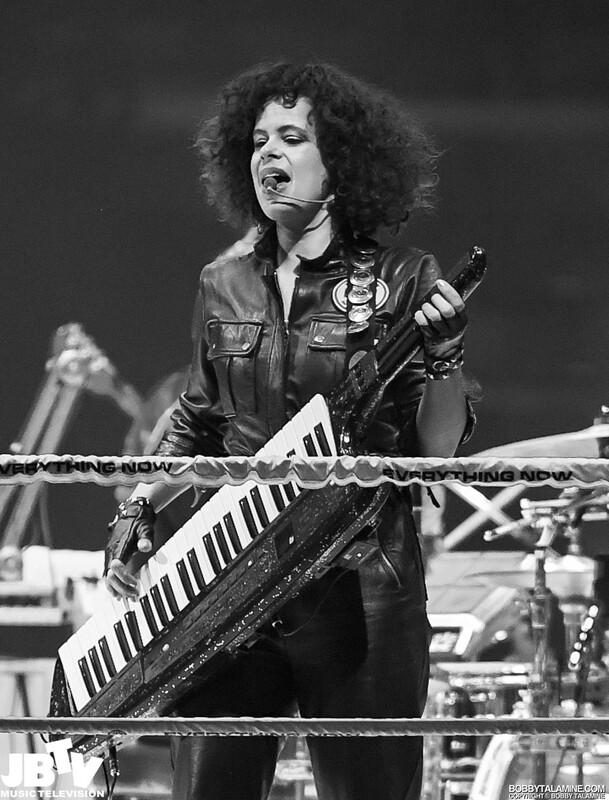 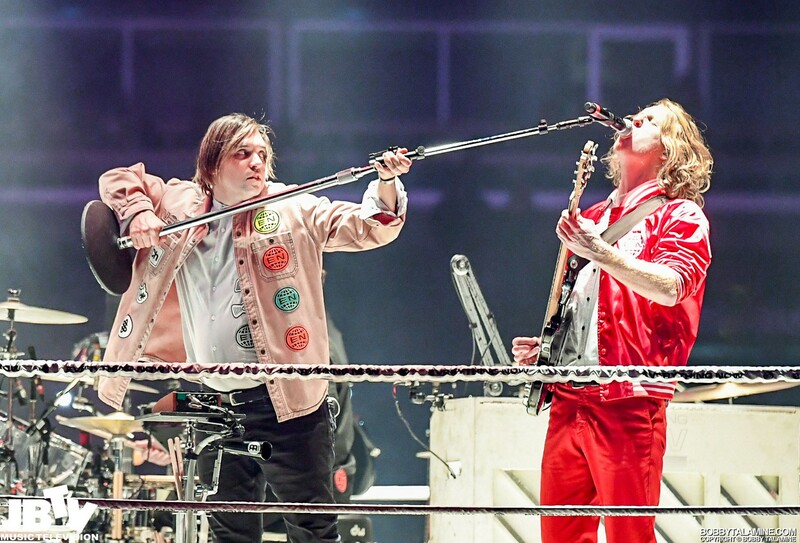 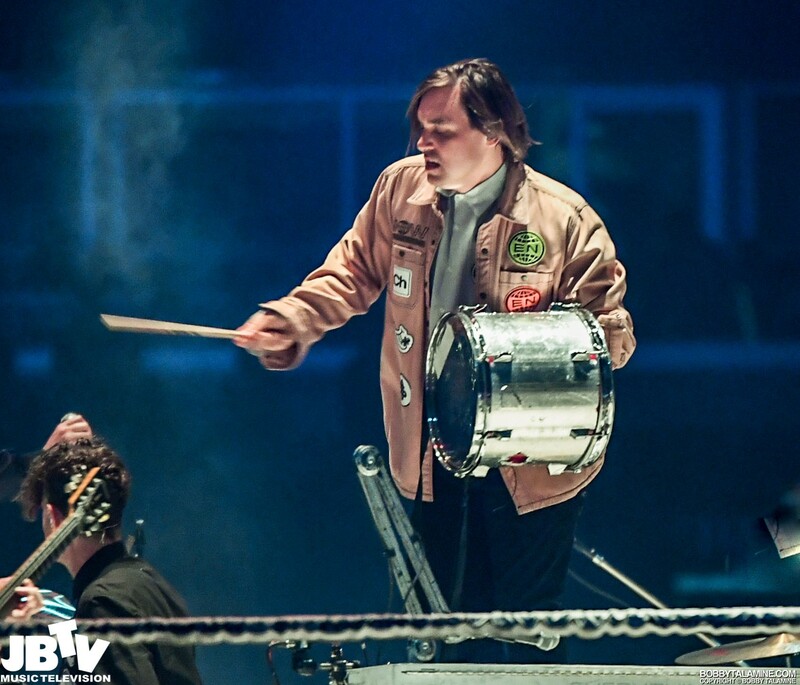 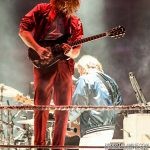 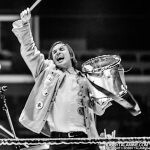 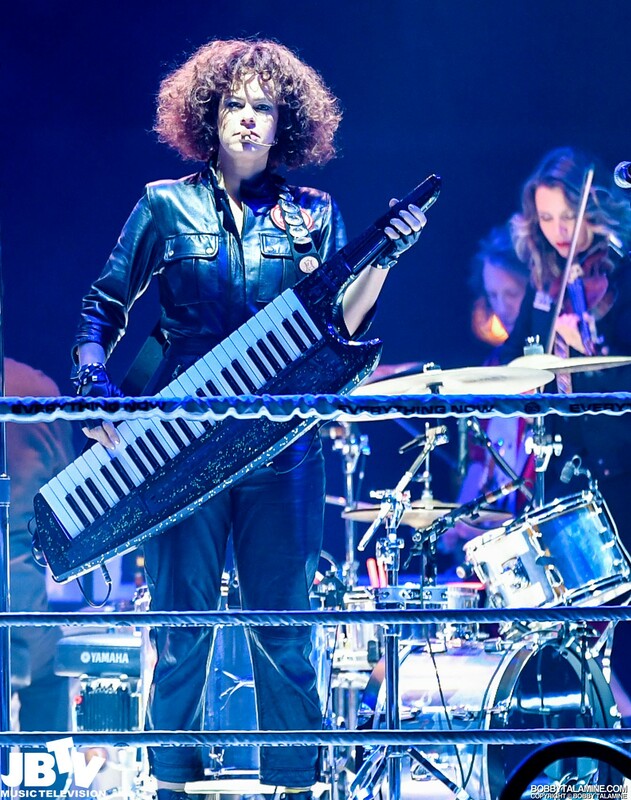 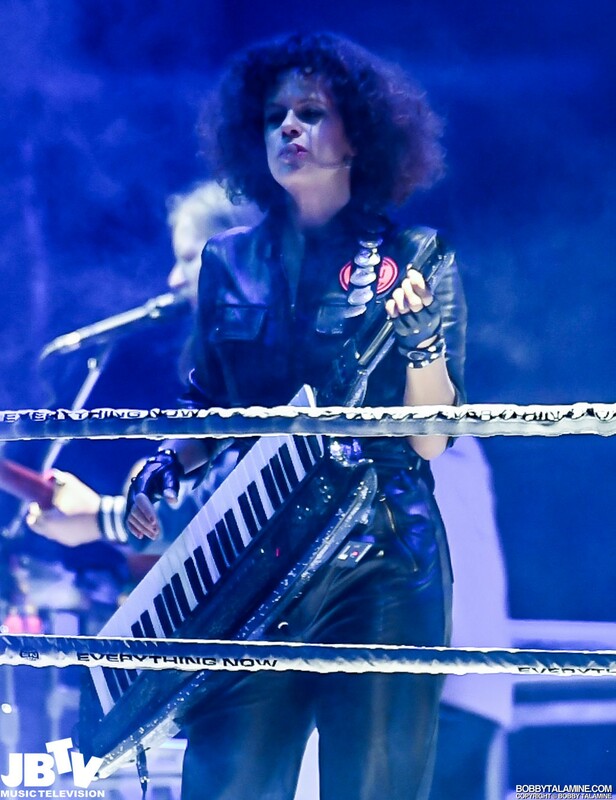 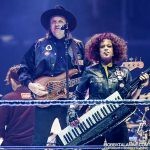 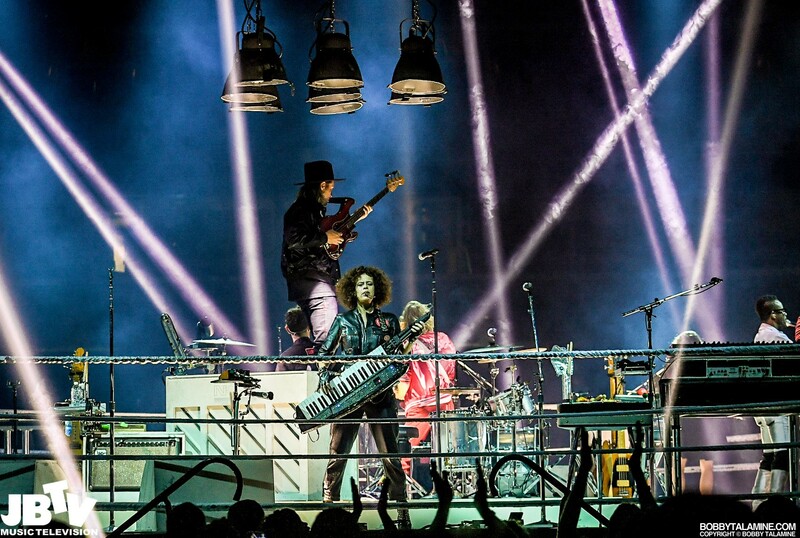 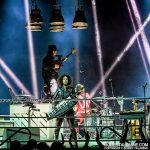 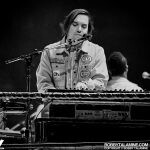 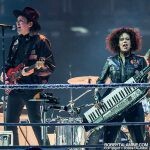 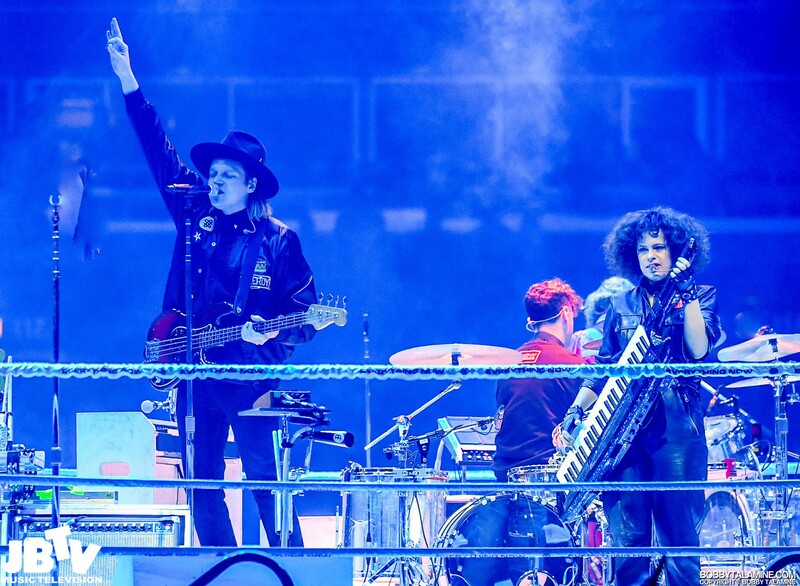 And while Arcade Fire are masterful at engaging fans during its shows, the intimacy of having Arcade Fire center floor in a boxing ring does provide the ambience of intimacy, even for a venue that can hold up to 16,000 people or so. 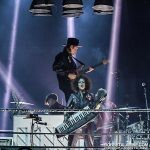 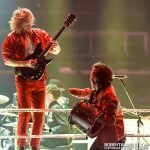 The musicians were set up in the round behind boxing ropes on a square stage, with at least two musicians facing each side of the audience at all times. 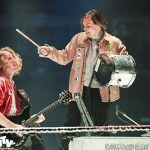 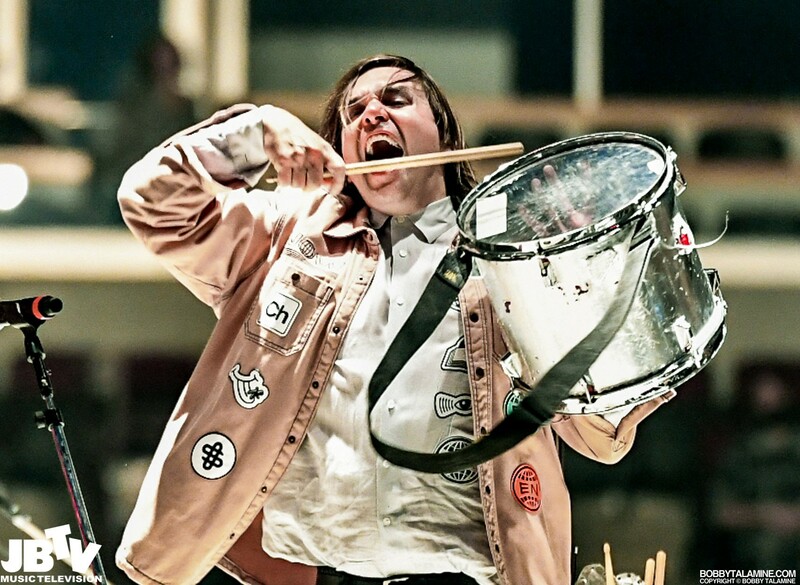 But as “Everything Now” shows all too clearly, Arcade Fire are going through an awkward phase of disenchantment, promoting and playing an album that has a branding campaign that’s tongue in cheek- with a nod and a wink. 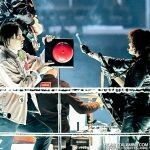 Play the songs live with some disco ball atmosphere- and promote promote promote. 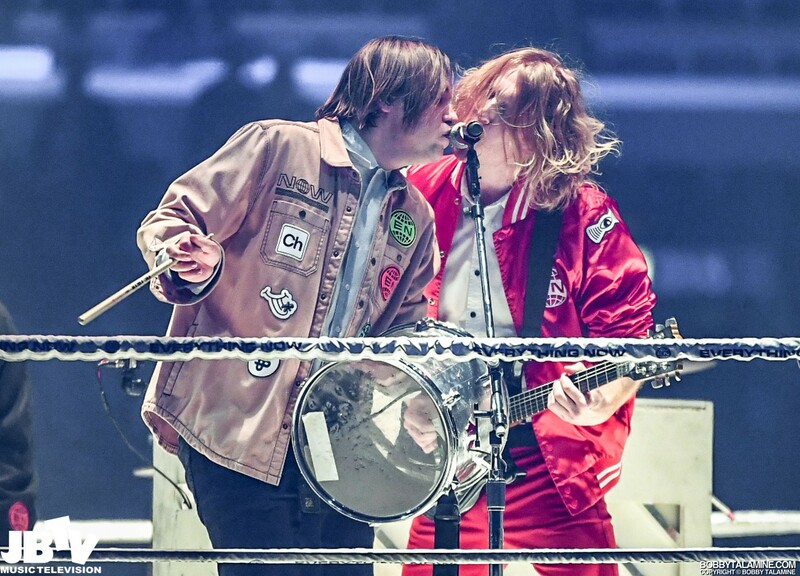 The fans clearly want the party anthems- the songs to dance to and swing your partner with. 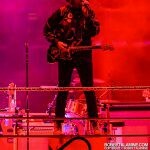 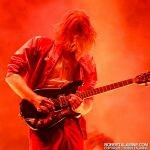 But it’s hard to grasp the new songs in the same way- at least not yet. 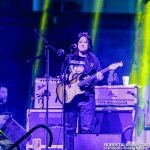 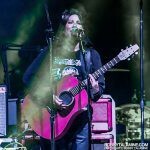 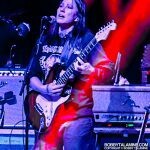 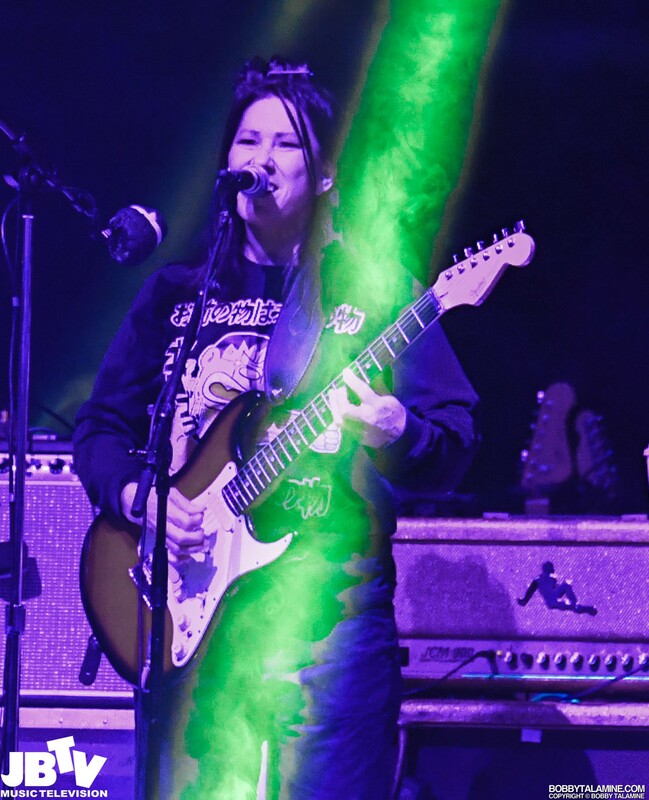 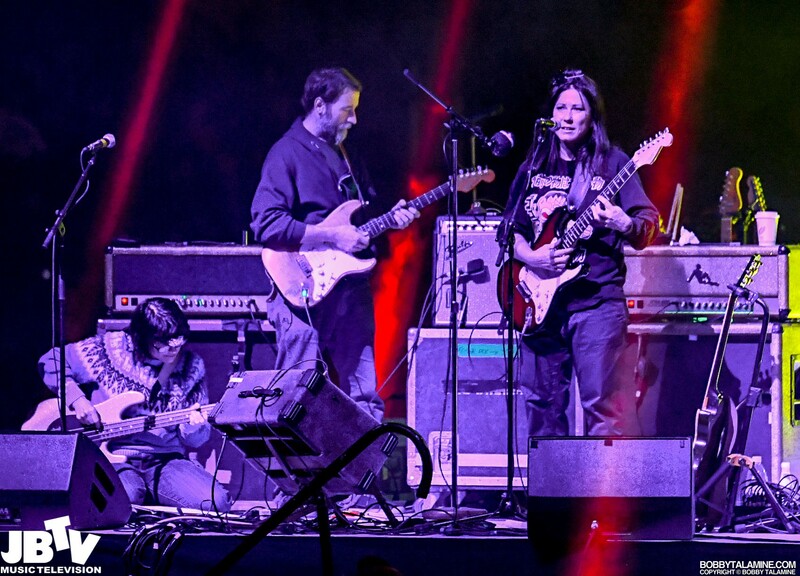 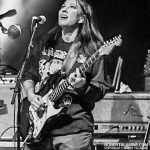 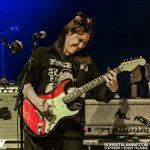 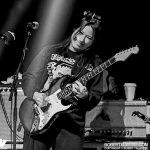 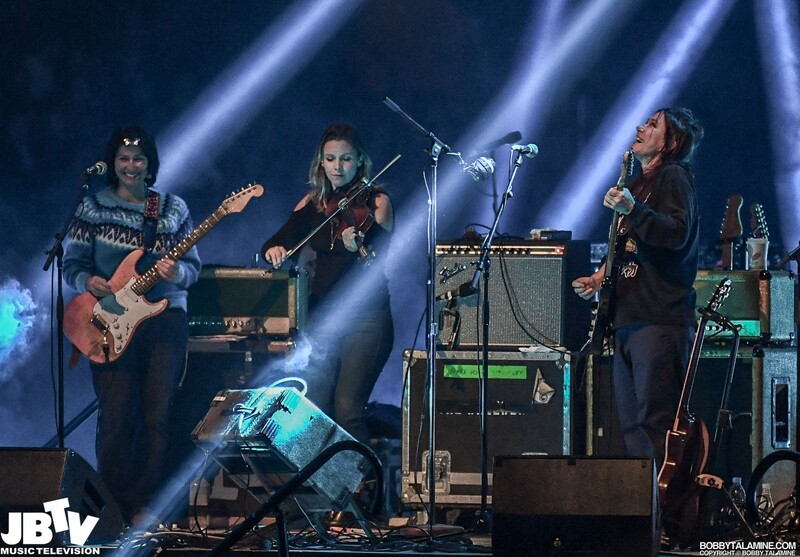 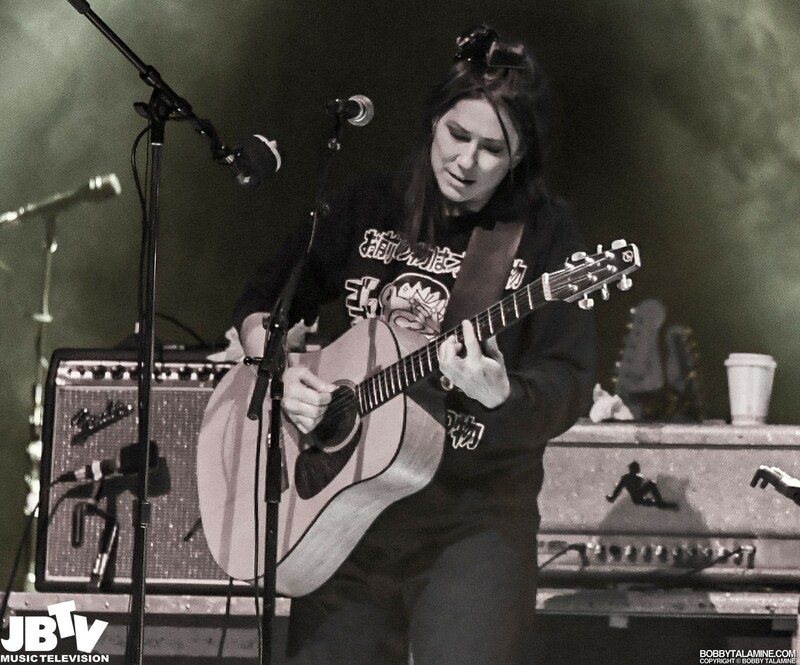 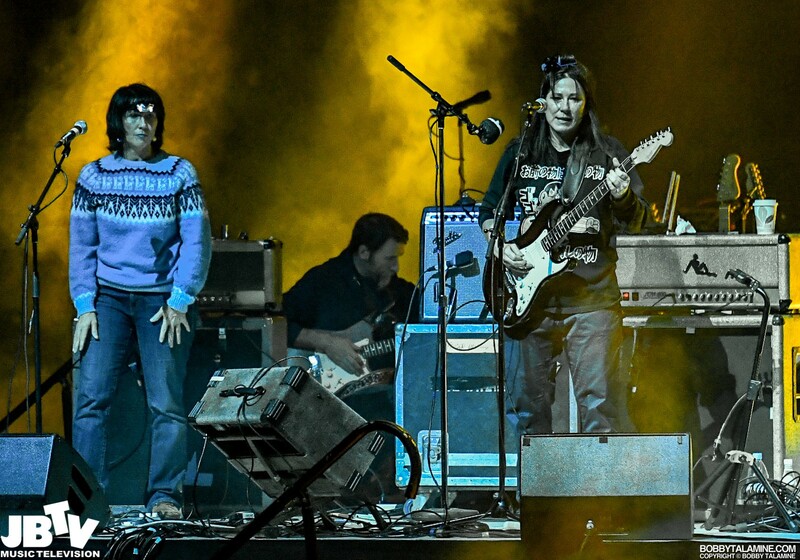 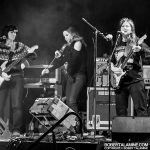 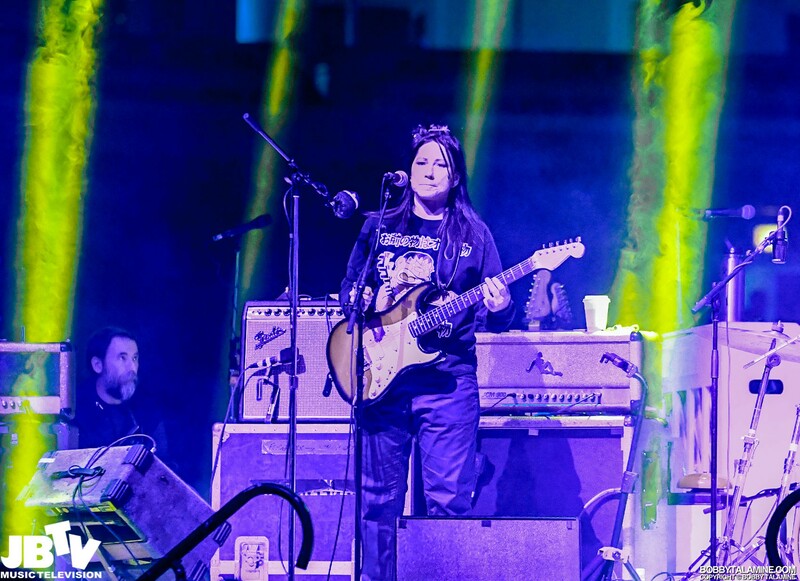 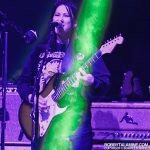 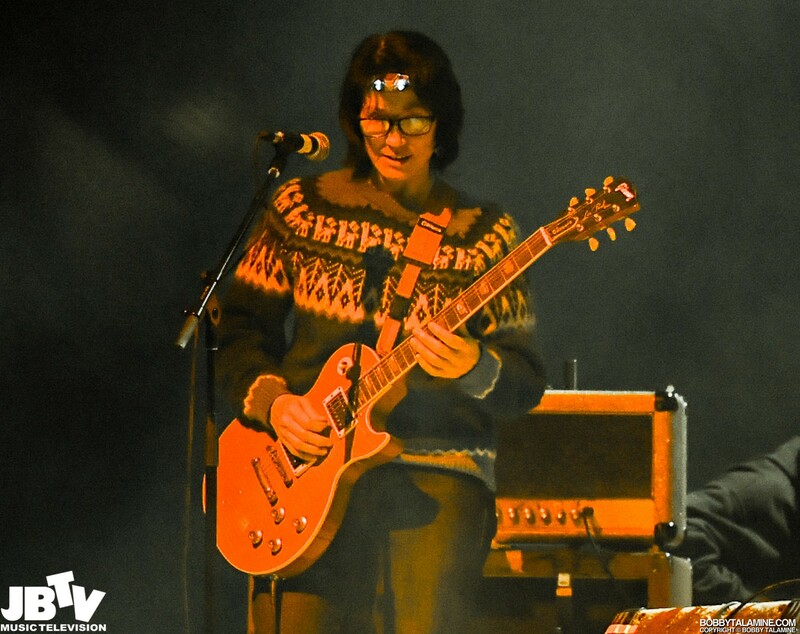 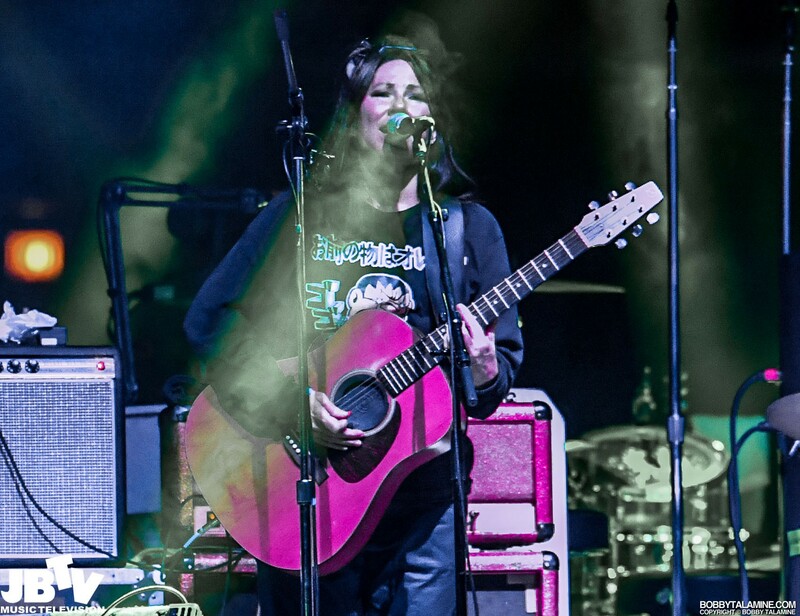 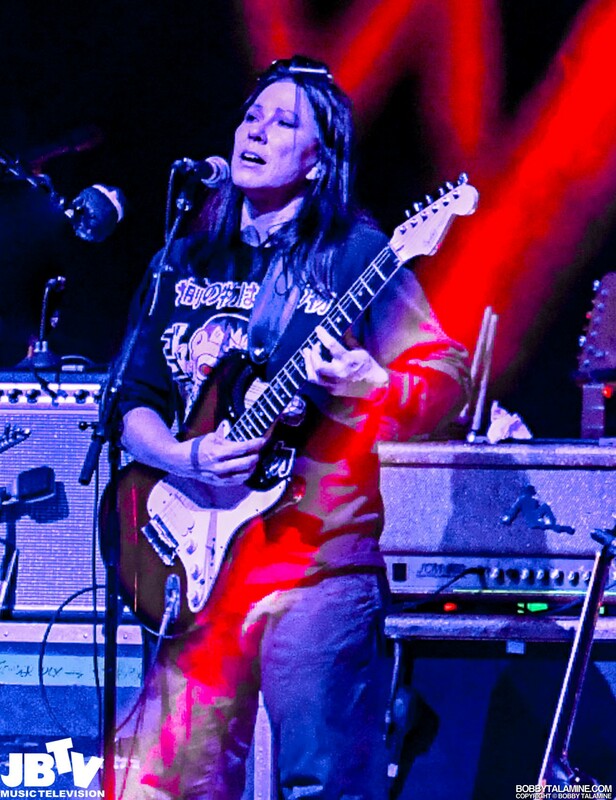 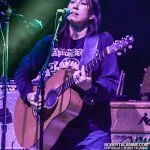 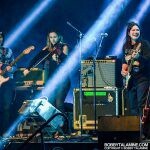 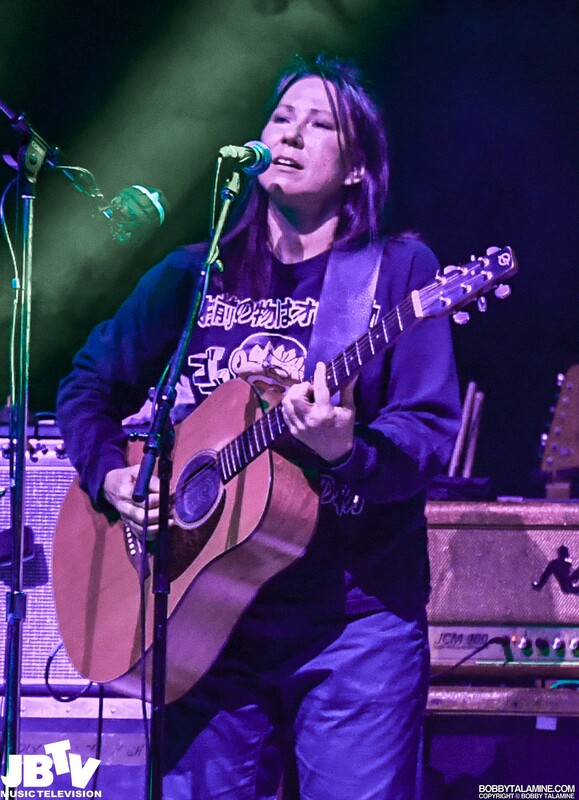 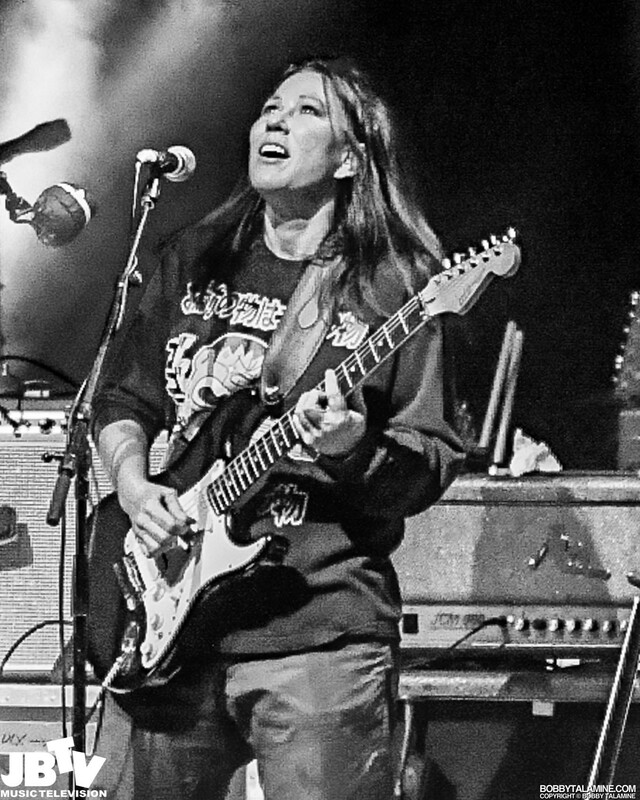 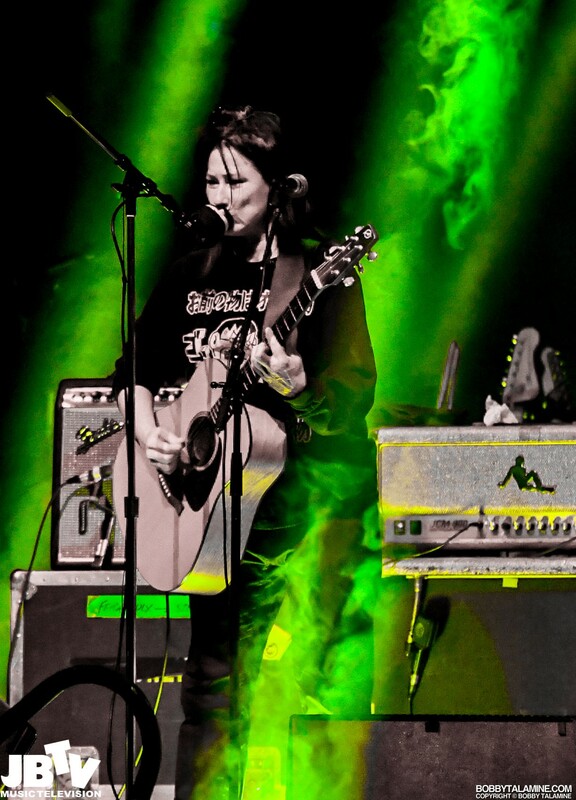 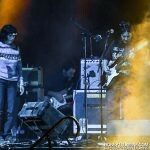 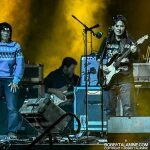 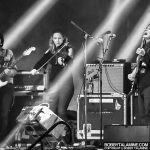 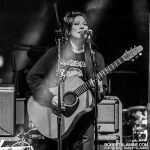 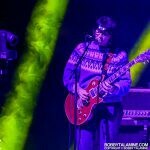 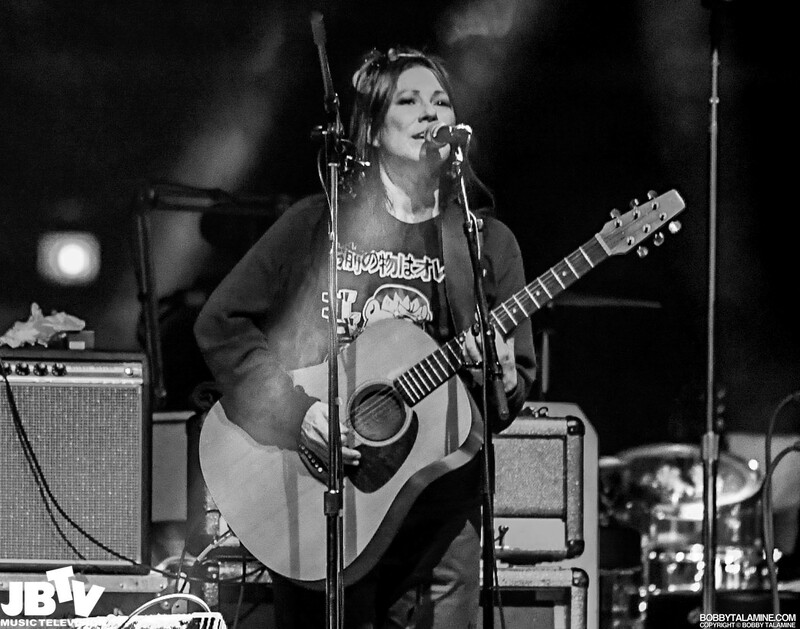 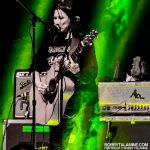 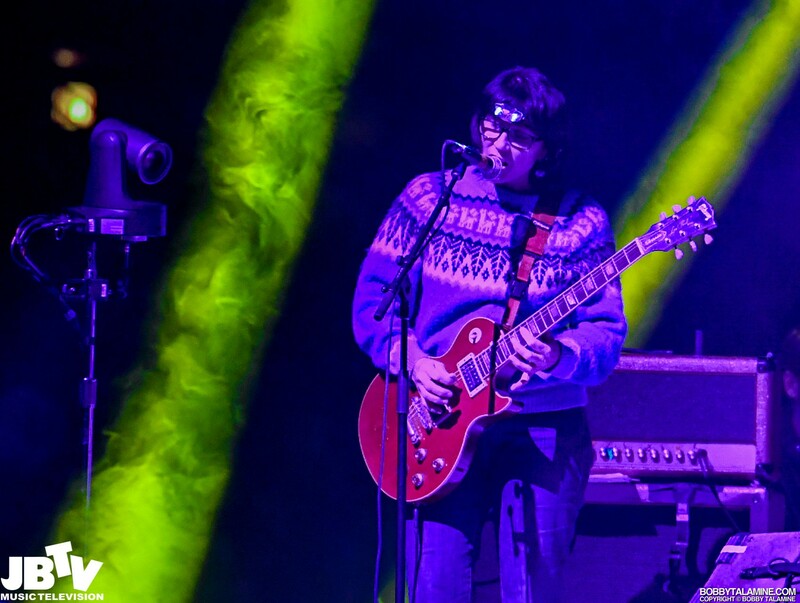 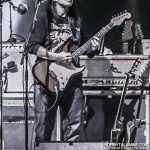 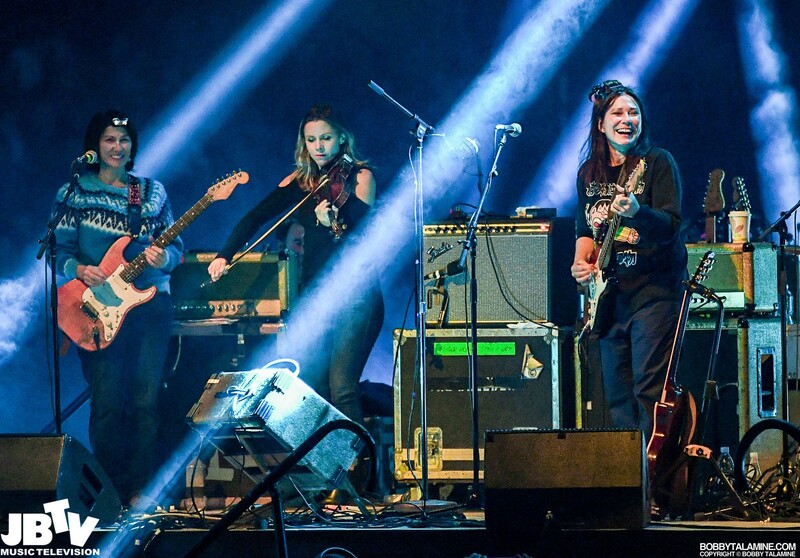 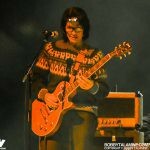 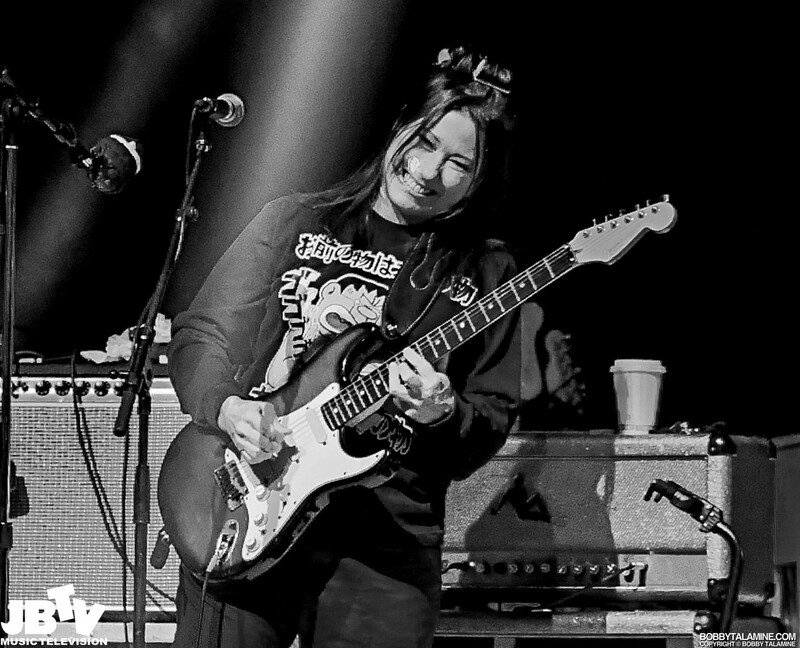 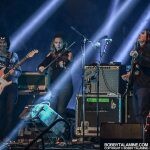 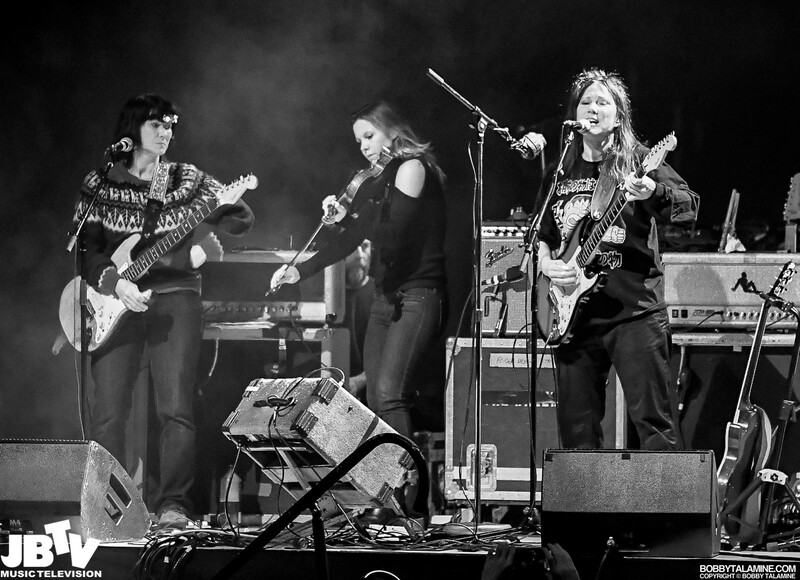 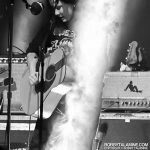 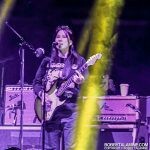 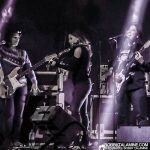 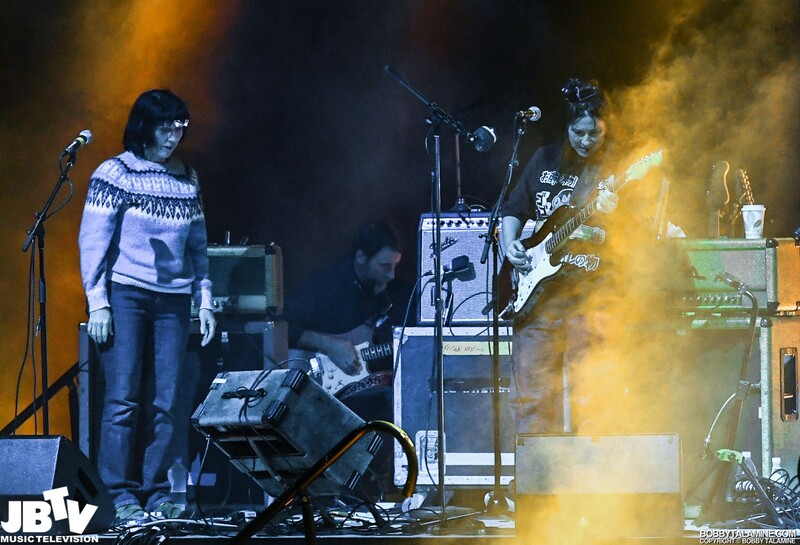 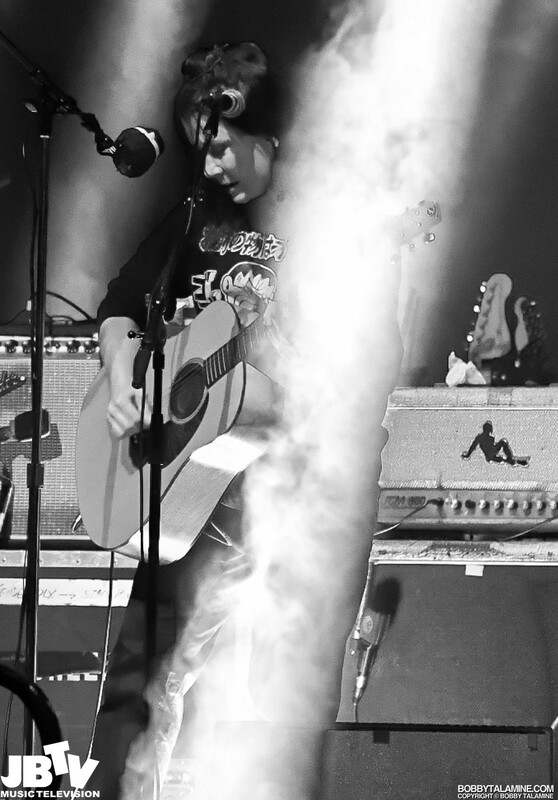 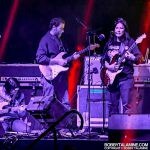 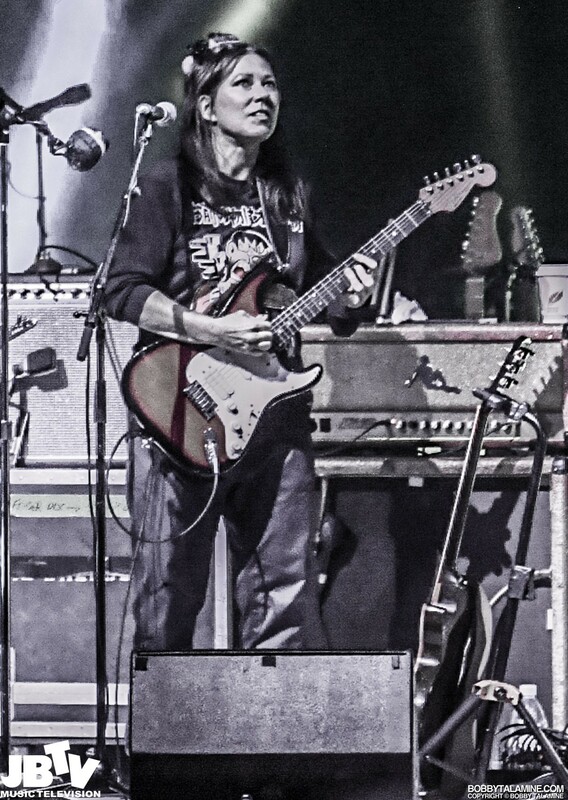 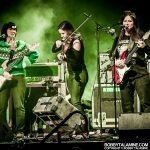 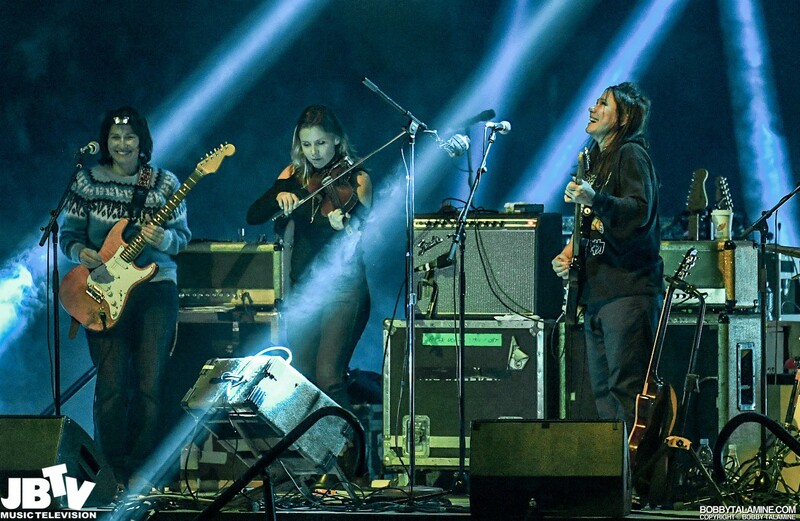 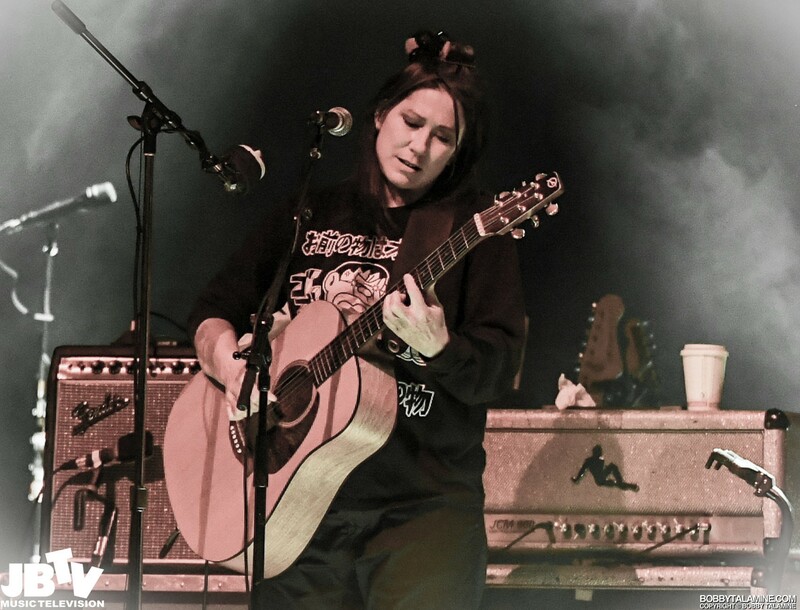 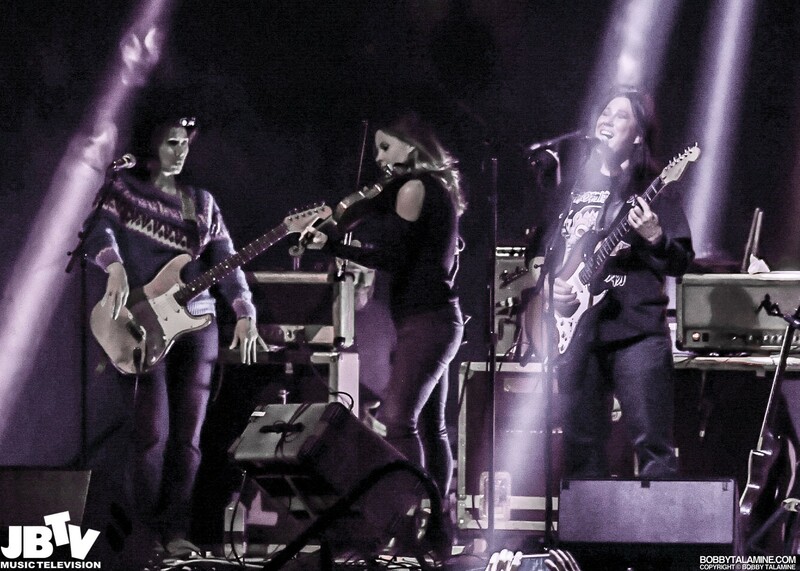 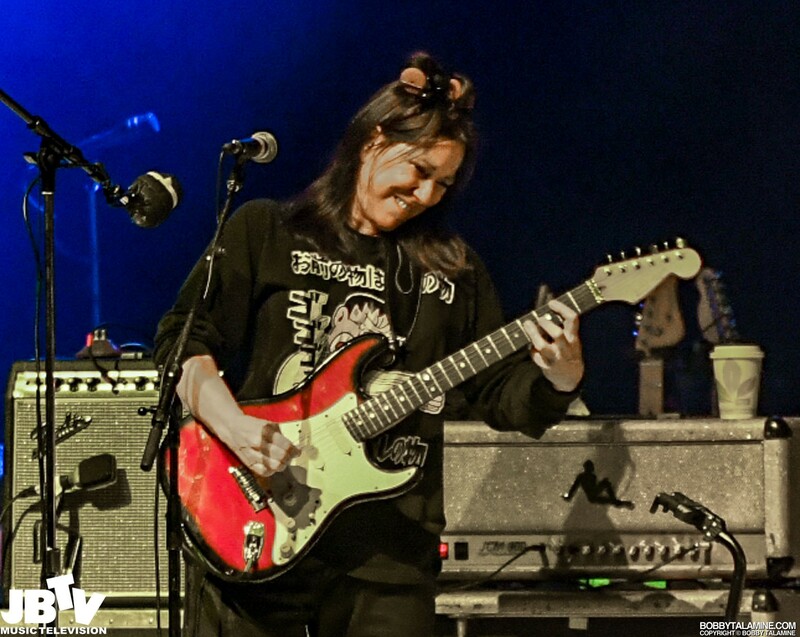 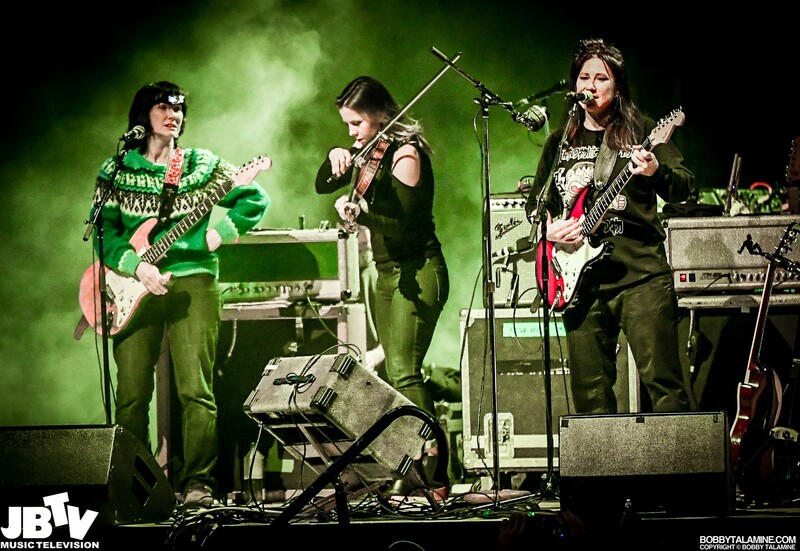 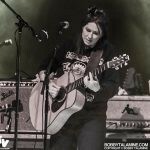 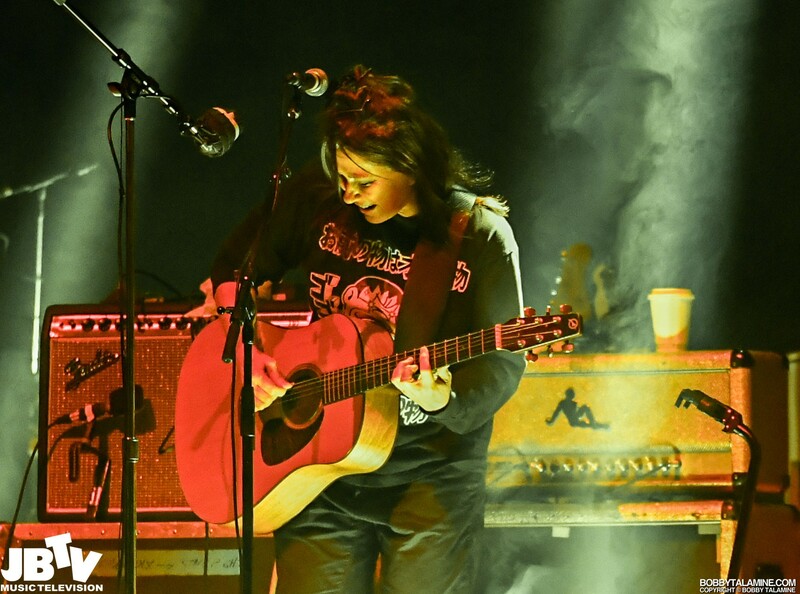 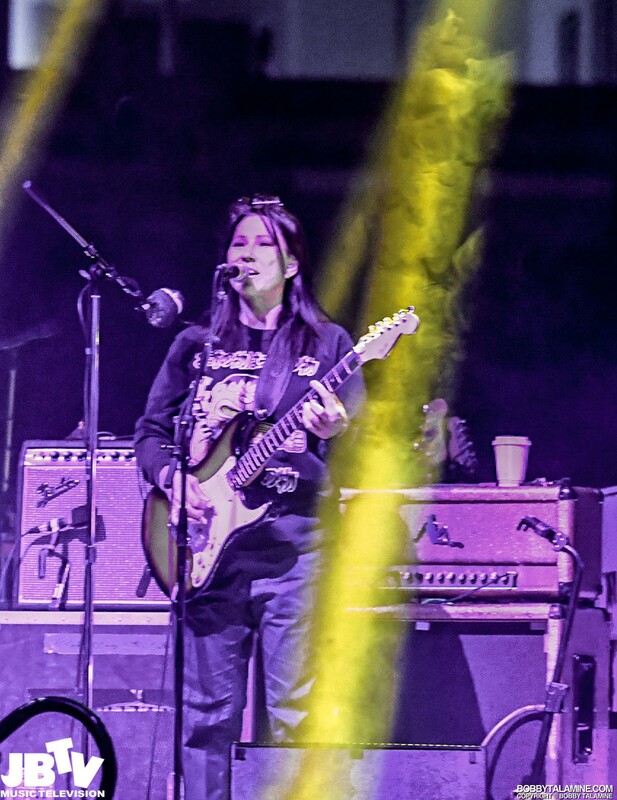 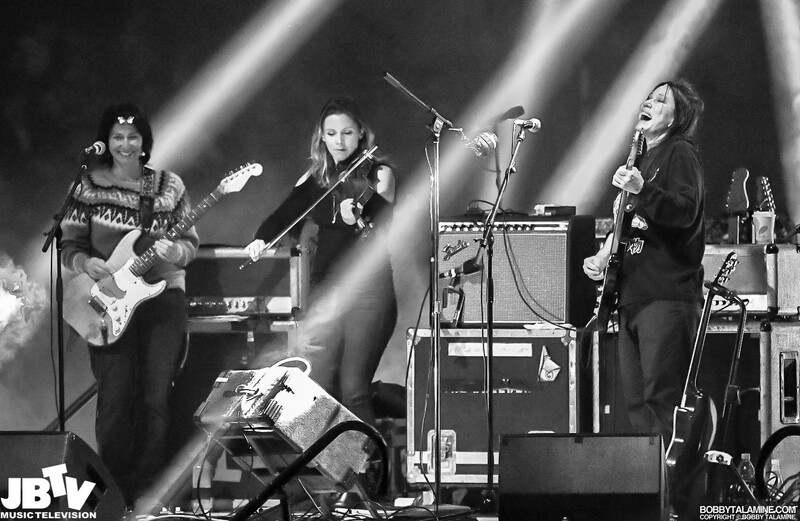 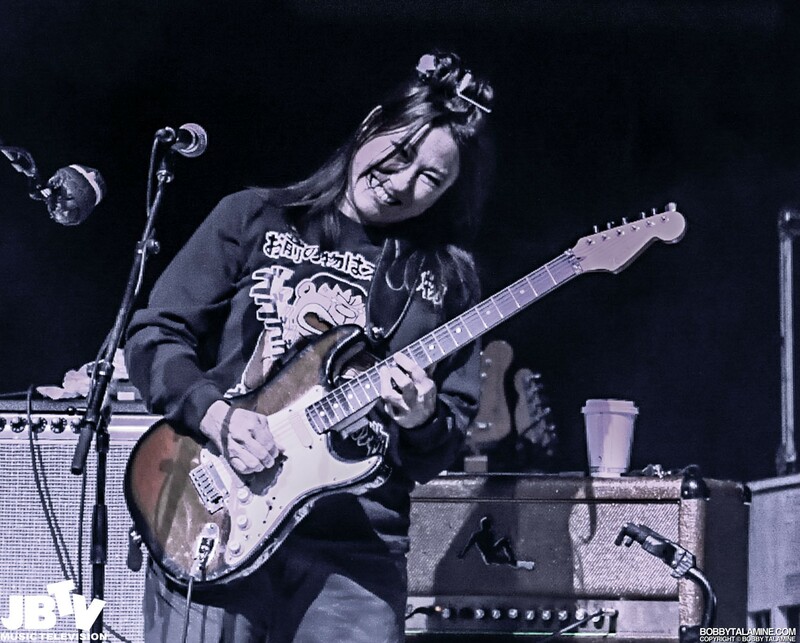 The breeders: Kim Deal and Kelley Deal – opened the show. 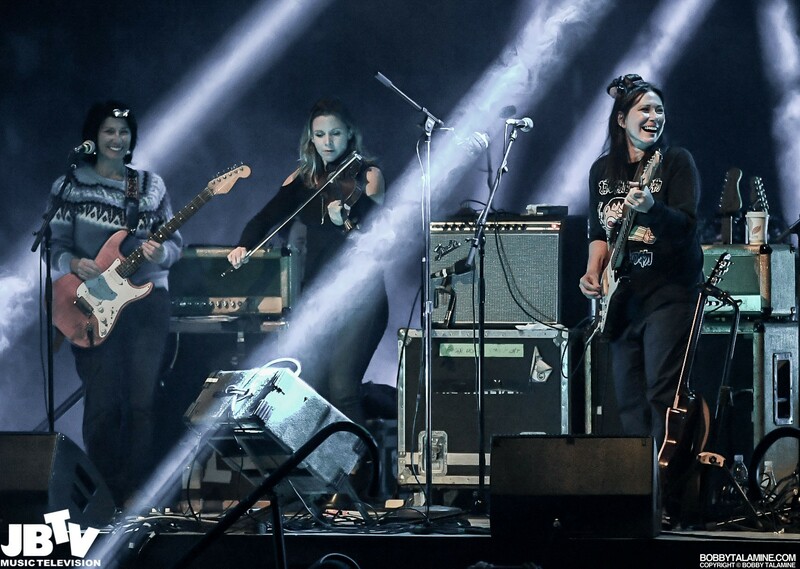 Albeit a rather brief set- but still, the Deal sisters know how to have fun, and talk like they’re one of your sisters from inside the boxing ring. 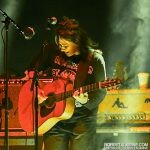 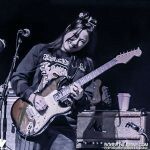 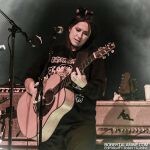 Gotta love the Breeders- Kim Deal having the keen sound and strong songs that defy their ages and time from the early 90’s.